Remember back in the day, when you needed a new website, you had to hire a team to design and develop one from scratch? As a graphic and web design/dev company, our clients come to us needing custom solutions for their sites with more requirements than a web template can offer. But for most people, using a free business WordPress theme for their website can be extremely advantageous. Not only is using a theme more cost effective, it also gives people a solid foundation for their site from which they can customize and allows them to maintain complete control over the site build out, content integration, and all the rest. 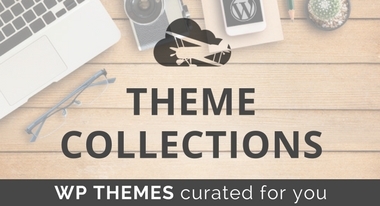 What Do These Themes Include? These themes are the most modern, having been rated highly time and again. If there are upsells within the theme, it’s for good reason – the authors have spent a good deal of time perfecting the themes and you tend to get premium features and support when upgrading. Most, if not all, of these free themes are responsive as well, so they will look great at any browser size including smartphones and tablets. 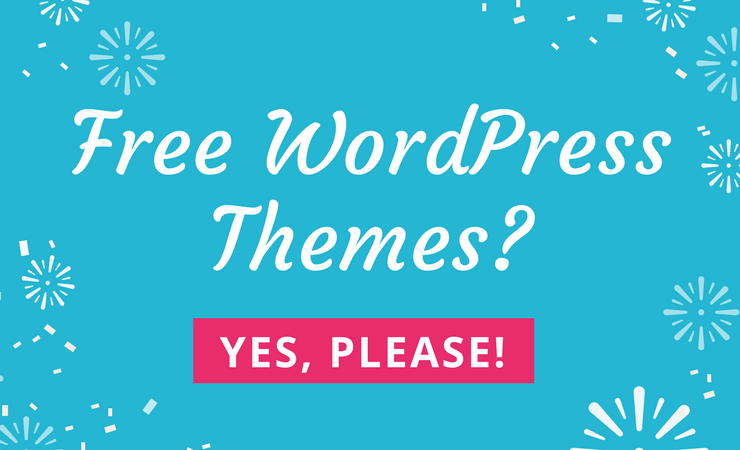 If you end up selecting one of the themes on this list here, you can create just about any kind of site. Yes, this list is dedicated to themes for businesses but so many are multipurpose these days, they can easily be adapted to suit a variety of subjects and niches. 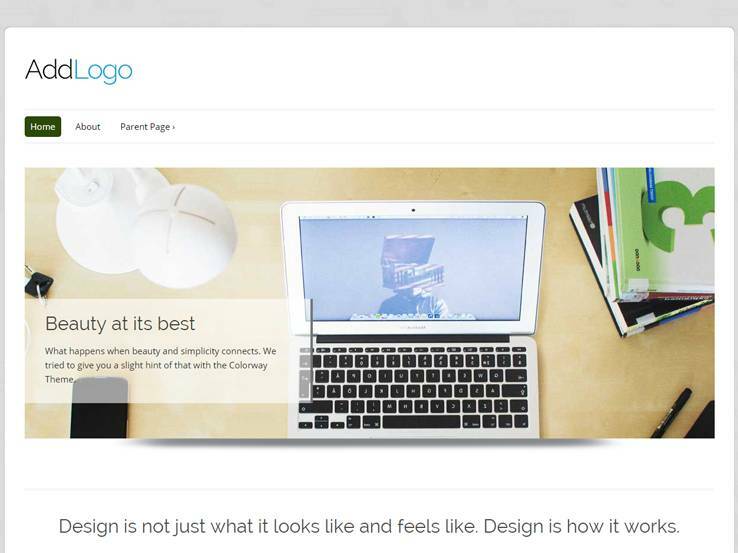 Try out the Allegiant theme if you are a creative agency that wants a clean and elegant theme. The Allegiant theme has plenty of white space to bring attention to your past projects and your services. The header area includes a full-screen slider which is perfect for sharing a brief description of your company or highlighting your services. The theme also includes several page templates so you can easily create pages for your services, portfolio, and testimonials where you can share more details than on the homepage. Use the blog page to share your tips and tricks with potential clients and to boost your search engine rank and take advantage of the shortcodes to easily add buttons, tabs, columns, and more without the need to delve into code. You can customize the theme on the backend to create the exact look and feel that you want and rest assured your website will look great on just about any device thanks to the responsive design. 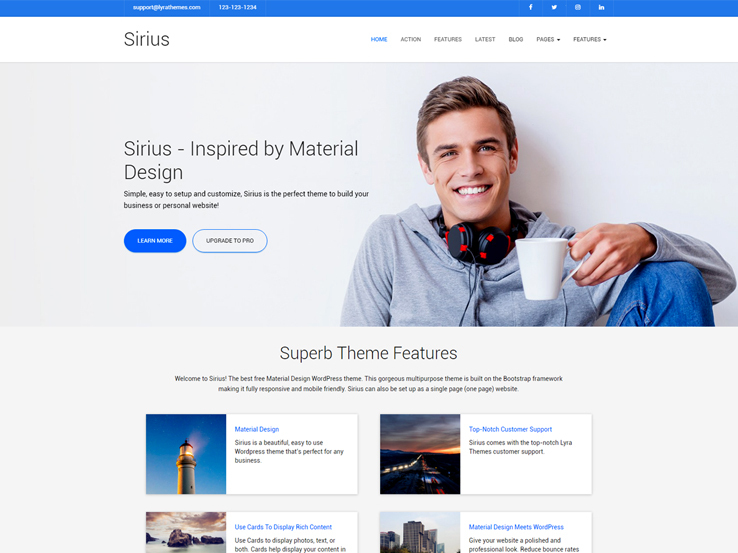 Sirius is a free business WordPress theme catering to those looking to build a successful company, capture more emails, and of course increase sales. Built as a one page theme with smooth parallax backgrounds, this multipurpose theme gives future customers something to be interested in from the start. This, along with a front page banner, multiple blog feed displays, and two CTA sections for guiding site visitors down your sales funnel, provides businesses of all sizes a great way to create an empire. Additionally, Sirius is compatible with the popular and free translation plugin, qTranslate X, so you can reach an international audience in no time. What’s more, Sirius comes mobile friendly and responsive so all customers can access your site at any time on any device. Lastly, there is no need to worry about having a generic website since there are unlimited front page features such as icons and images for making your business site standout amongst all of the competition. Check out the Parallax One theme if you’re interested in a killer full-screen theme without the clutter of many other options on the market. This is a stunning, and responsive theme that looks great even on mobile devices. The Parallax One theme is a one-page design, keeping people on one area of your site where they can easily see all the information. Localization files are a huge plus, allowing you to translate your entire website. Parallax One provides a stunning header area that takes up just about the entire screen. The parallax effect is ideal to add visual appeal to your website while the overlaying text and buttons work as call-to-actions towards other parts of your site. 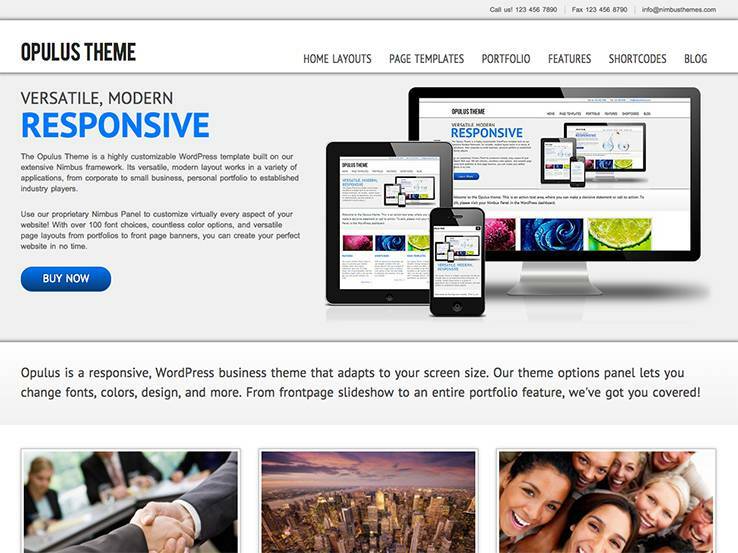 As with many one-page WordPress themes, the theme includes a wide variety of content blocks. These are easy to implement and they are predesigned for sections featuring products or client testimonials. One of the sections has images of your team members, along with titles, names, and animations when users scroll over the images. The client testimonials also provide imagery, along with the quotes from people you’ve worked with in the past. Several call-to-action buttons can be placed throughout the homepage and a Latest Posts widget can be used to showcase your recent blog posts in a professional manner. This not only gives your content more exposure but it allows you to position yourself as the authority in your niche. Map support is offered, and the contact form combined with social media buttons and contact information provides an easy way for visitors and potential clients to get in touch with you. Consider the Ember theme if you want premium features and beautiful design without a hefty price tag. 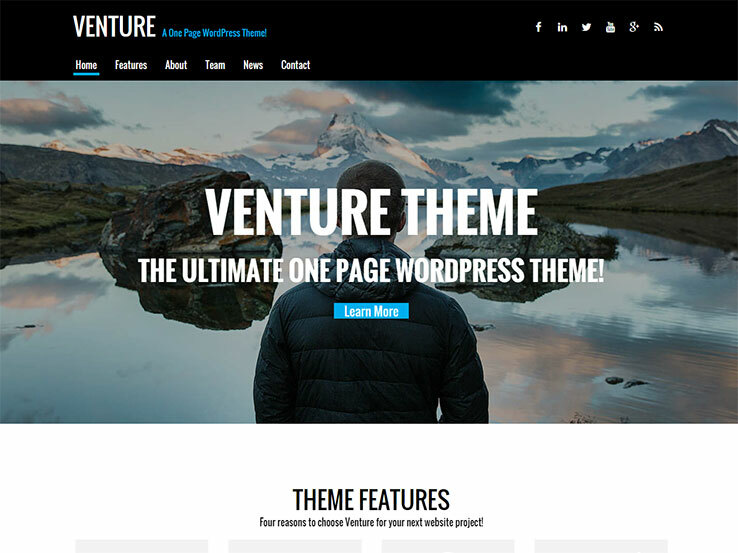 This theme has plenty of features that allow you to create a stunning online presence. 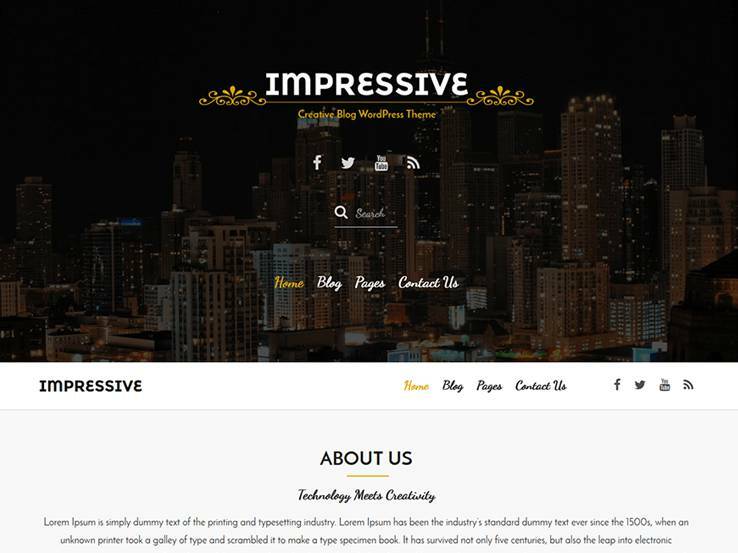 It’s a one-page theme that has a beautiful full-width header image and several parallax sections which are sure to create a great first impression. The best part about the parallax sections is that they won’t slow down your website while still giving your website added visual appeal. On top of that, they are great for including calls to action to drive people to other areas of your page. 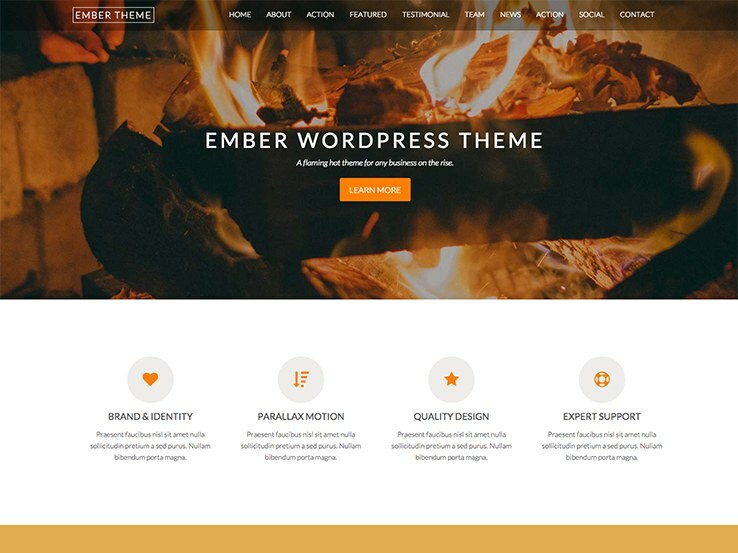 As with most of the better WordPress themes, the Ember solution has several sections to customize. Add a contact form that has customizable fields and allows potential clients to easily get in touch with you. Include testimonials from past clients to build social proof and your credibility. Finally, the “Meet the Team” module allows you to feature members of your team and include their photo, brief bio, and social media profiles. Overall, the Ember theme is a solid choice, so check it out and don’t forget to consider the premium upgrade. With Simpleshift, you get some pretty special features. The free, one page WordPress theme is popular with a wide variety of companies, considering you can quickly setup a landing page layout or fit most of your content on a single page. This is especially useful when you consider the mobile device usage is on the rise and many people prefer a simpler layout to be able to see all the information in one place. The theme is completely responsive so both these features allow you to create a website that won’t cost you potential clients due to poor design. Take advantage of the “Meet the Team” module to feature your partners, coworkers, or employees and share a brief bio, their social media profiles, and their photo. Use the social media buttons to drive people to your preferred social media platform and consider using the contact form in one of the parallax sections to allow potential clients to get in touch with you. The recent posts section allows you to give your visitors a preview of your posts which can help you increase your search engine rank and connect with your audience by sharing useful tips and tricks. 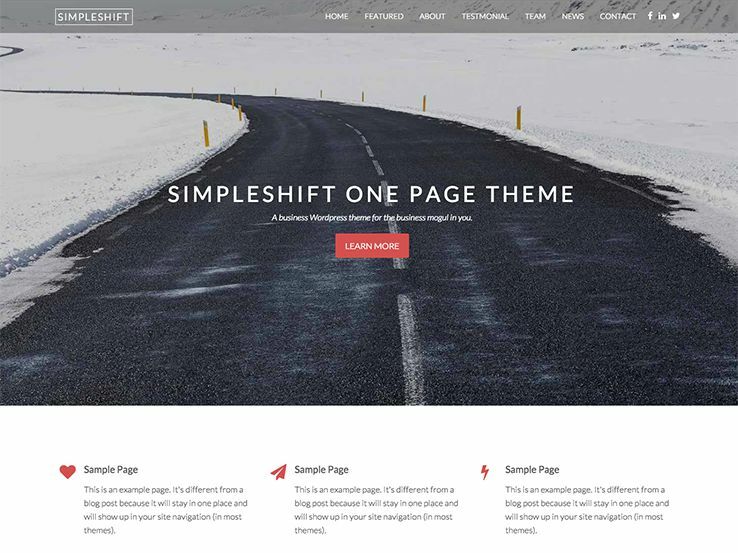 Along with testimonials, a logo uploader, and a wonderful parallax header module, the Simpleshift WordPress theme is one of our favorite free themes for small businesses. 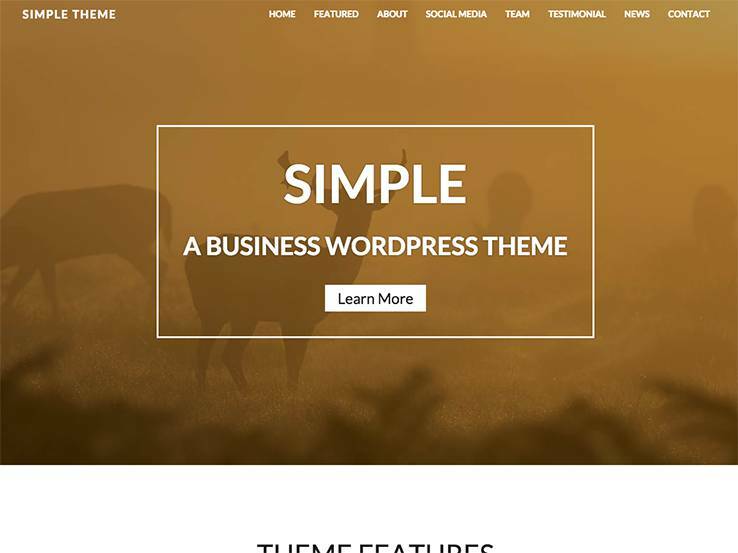 Simple Theme is among the most popular free WordPress business themes from Nimbus. The full-width banner image allows for high-impact design from the get-go. Choose to display blog posts or custom home page content in addition to featured pages on the front page. The Simple theme is fully responsive and looks great on all devices, and has been tested on all of the most popular browsers to ensure your site looks great to anyone, anywhere. Simple Theme is also completely versatile in design and function. It is translation-ready and is compatible with loads of great plug-ins and nearly every feature can be customized for your business. When starting a small business or startup, it’s essential to keep costs low. Using a free theme for your website is a great way to keep your cost low but finding a high-quality free theme can be a difficult task. However, the Venture theme is a different story. It has all the features of premium themes but won’t cost you a penny. Developed by Nimbus Themes, this is an impressive theme for companies that want creativity and simplicity. The header area features a beautiful parallax image that supports high-resolution photos to feature your products, services, or even your company offices. Add a text overlay and a button to include a brief company description and to drive people to your sales pages. This theme has a one-page layout which allows you to present all the information in one place, reducing the amount of clicking for anyone who visits your website. Other notable features include social media buttons combined with the navigation bar which brings visitors to certain sections of your website. Social media buttons, on the other hand, allow you to grow your social media following and connect with your audience on their preferred platform. Along with several call-to-actions and a “Meet the Team” area, you can’t go wrong with the Venture theme. You can also include testimonials and a module to display your latest blog posts. 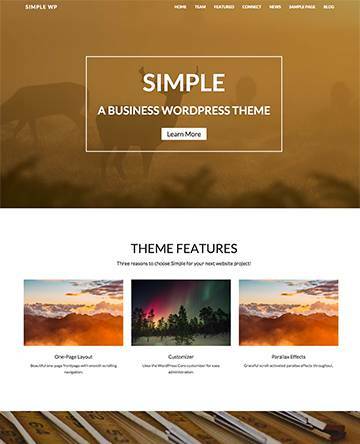 The Simple Business WordPress Theme is a clean and feature-rich, responsive, free theme. Support is offered through community forums on WordPress.org and a Pro Version of the theme is available through Nimbus Themes if your site calls for even more options. Simple Business is highly customizable with access to GoogleFonts, custom backgrounds, and multiple page layout options. Need a stylish theme to get your business off the ground? I can’t think of a better option than Sydney. This theme is responsive and gorgeous, allowing you to quickly build an online presence that suits the needs of individuals and larger businesses. It comes with plenty of customization options, too, so you can easily get the look you want without having to touch code. Some of these options include Google Fonts, unlimited colors, multiple layouts, a full-screen slider, custom logo, custom header, sticky navigation, and more. All of this is managed through the theme options panel. The homepage is completely customizable as well thanks to the use of blocks that you can drag and drop to get the look and feel you want. Some other features include parallax backgrounds, social media integration, and translation-readiness. 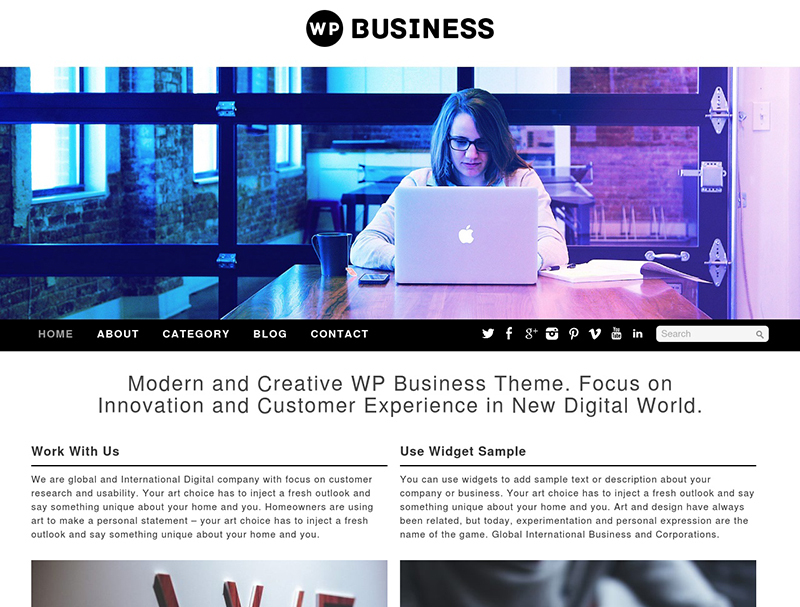 WP Business is a free WordPress theme that allows you to build an effective business website to promote your company/brand online. Whether you’re working for a big or a small company, you need to realize that a website is an affordable and fundamental tool that every business needs. Your website is what helps your customers learn more about your company, your products, and services and finally determine if they want to do business with you. Now let’s take a closer look at the WP Business Theme: a clean design and a wise use of whitespace ensure key information stands out, a well-organized layout provides easy navigation; a responsive image slider on the top of the homepage features the most important visuals. The theme is responsive, SEO-friendly and cross-browser compatible. Also, it comes with a full-featured blog where you can share your expert opinion and company news. 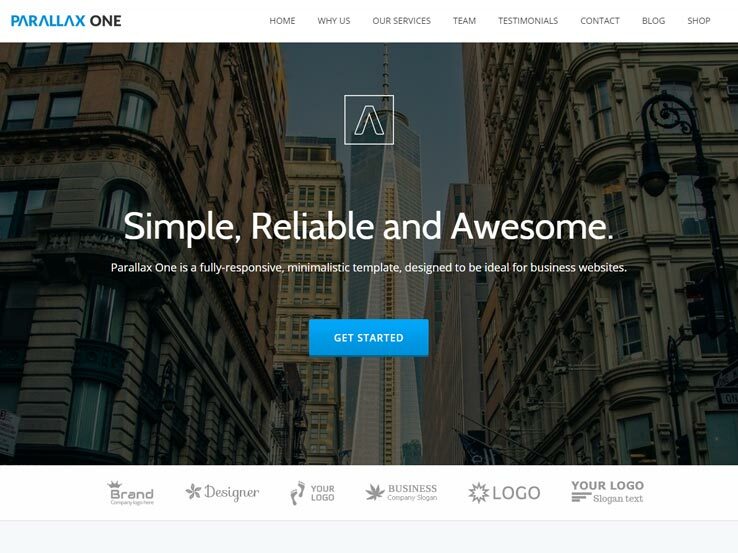 Download this free business WordPress theme and help your business look professional online. 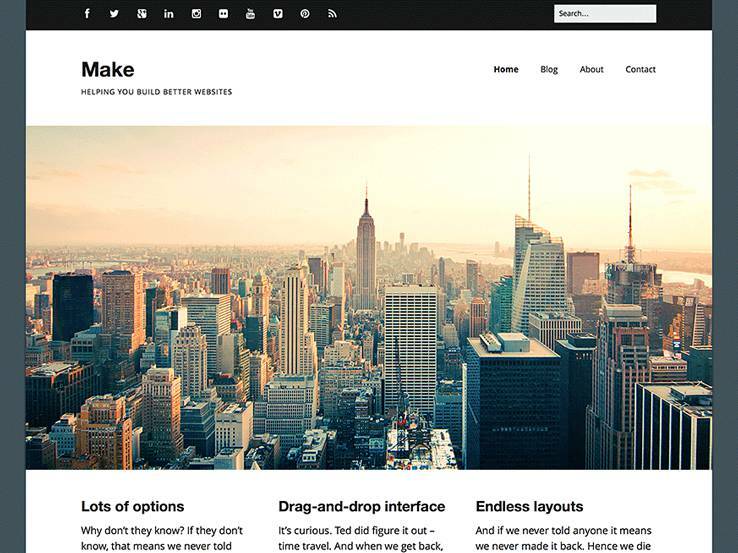 Make, from Theme Foundry, is a great free business theme with a versatile design for any type of business. The theme features a full-width banner image on the front page, making your site modern and inviting. The drag-and-drop page builder allows you to edit the theme to fit your needs using zero coding. Make offers multiple page templates, including a portfolio, and is built to be responsive. 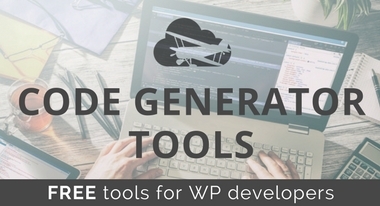 It is also compatible with lots of new and great plug-ins like WooCommerce, WP PageNavi, and Gravity Forms, ensuring your site has all the functions you might need for your business. 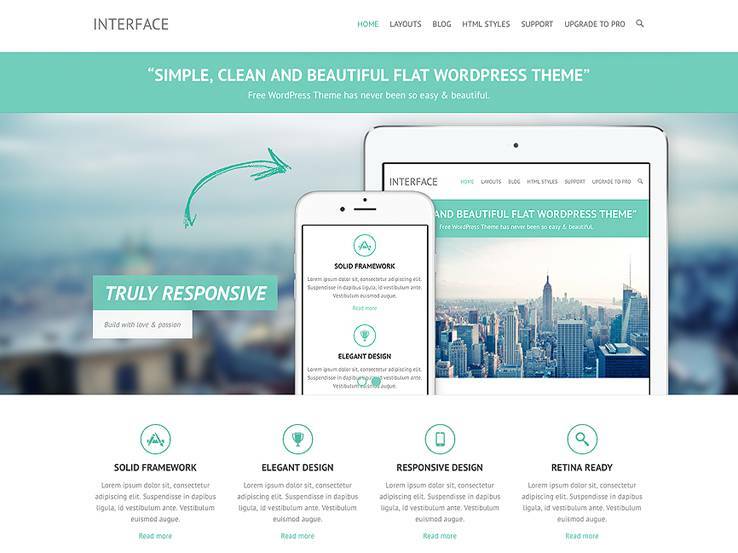 Interface offers customization through numerous theme options, custom backgrounds, headers, menus, favicons, and more. The theme is also built to incorporate translation capabilities and popular WP plugins. Free support is also offered for this theme at the Theme Horse shop. Design-wise this theme is clean and simple with great full-width images and is completely responsive. 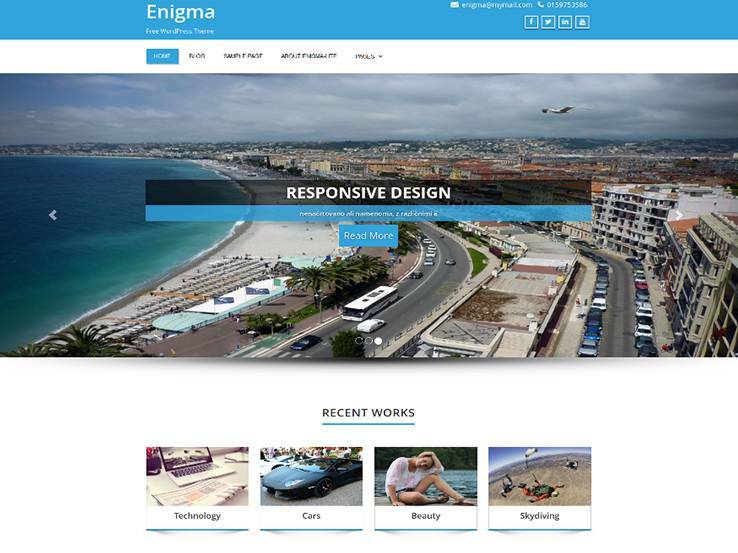 Enigma is a clean and modern business theme that is responsive and cross-browser compatible. 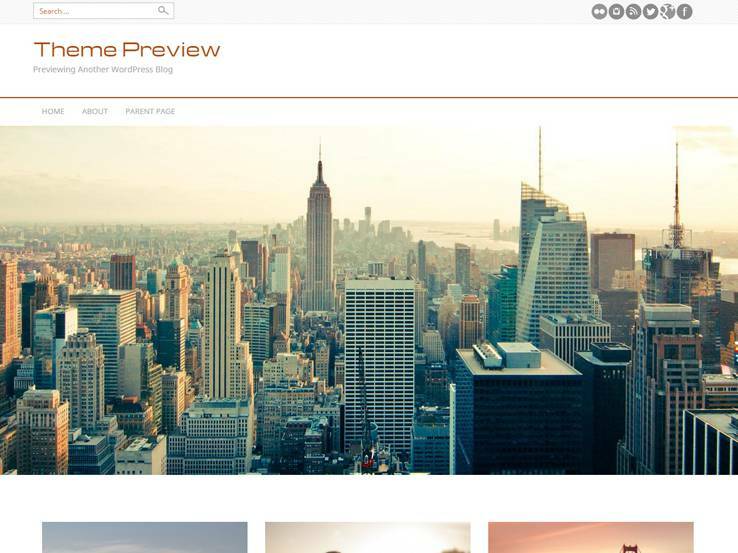 This theme also has multiple page layouts including blog and portfolio pages. A Theme Options panel allows you to edit Enigma to match your brand without learning CSS. The theme is also translation and Retina ready. This is a really beautiful business theme with a great full-width image on the front page. The parallax options in Moesia are versatile and allow you to create a visually appealing website. 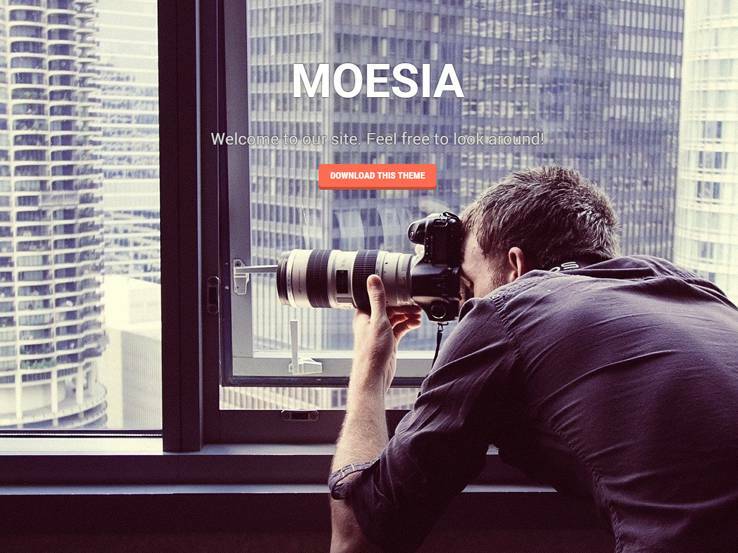 Moesia theme has options for custom backgrounds, colors, headers, menus, and layout. 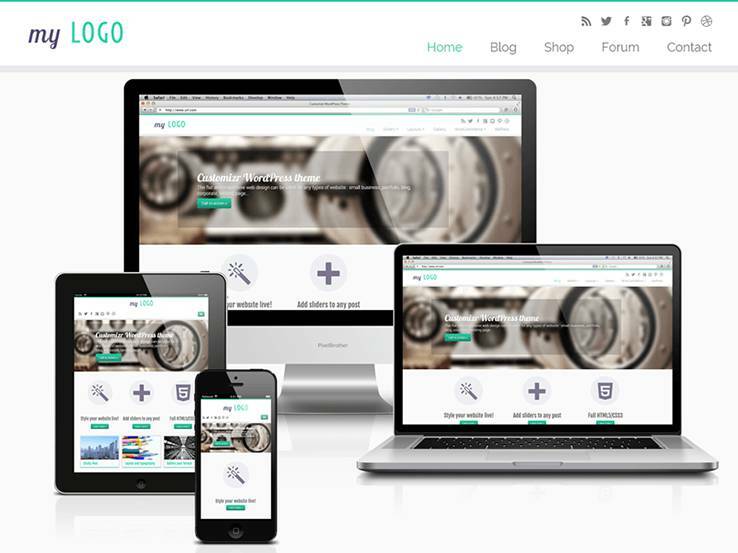 It is also a responsive theme that will look great on any device. 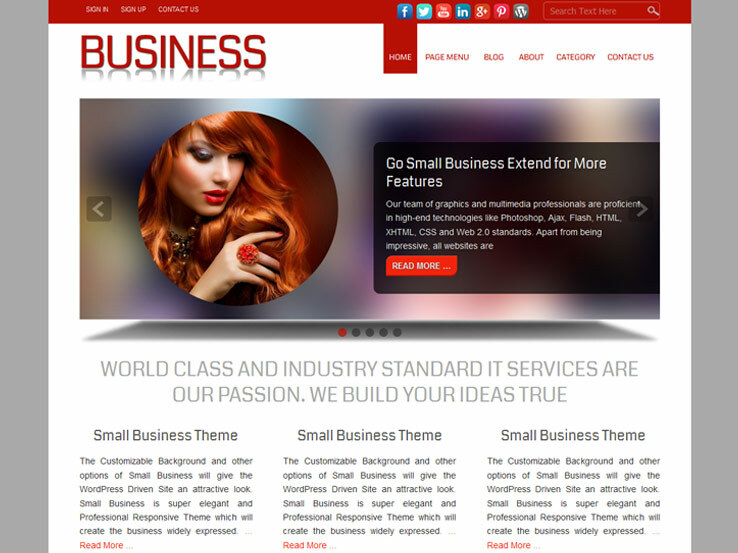 This theme is great for any business that wants to be seen as cutting-edge, creative, and modern. The Parabola theme is built for customization. Nearly every element offers unlimited options so you can tweak every little aspect of your site. The theme is responsive and includes integration with social media. 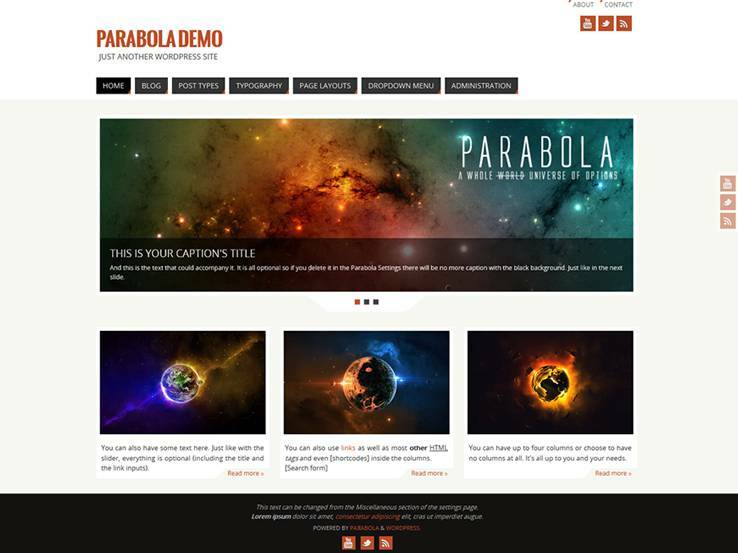 Parabola is also translation-ready and offers shortcode support and 8 widget areas. The grid layout is easy to navigate from any device. Parabola is a great option for any type of business. This theme is built for speed and has a responsive design. This theme offers compatibility with numerous plug-ins so you can add even more functionality to your website. 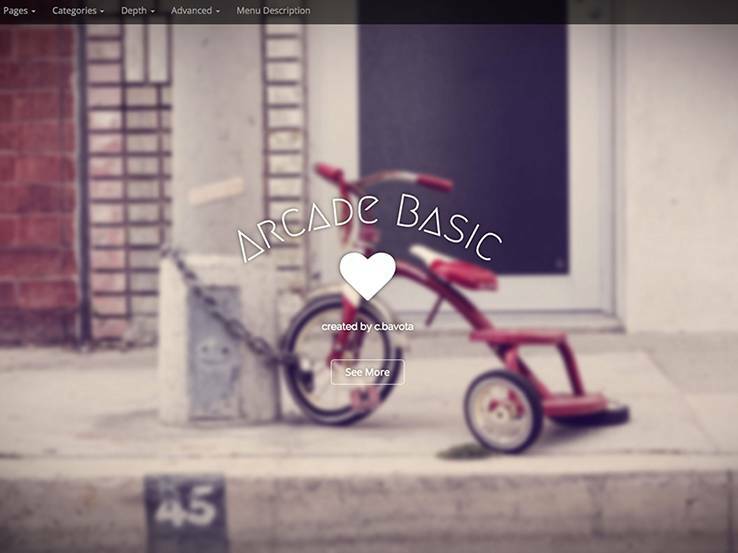 Arcade Basic includes a Theme Customizer to edit page elements easily without CSS. 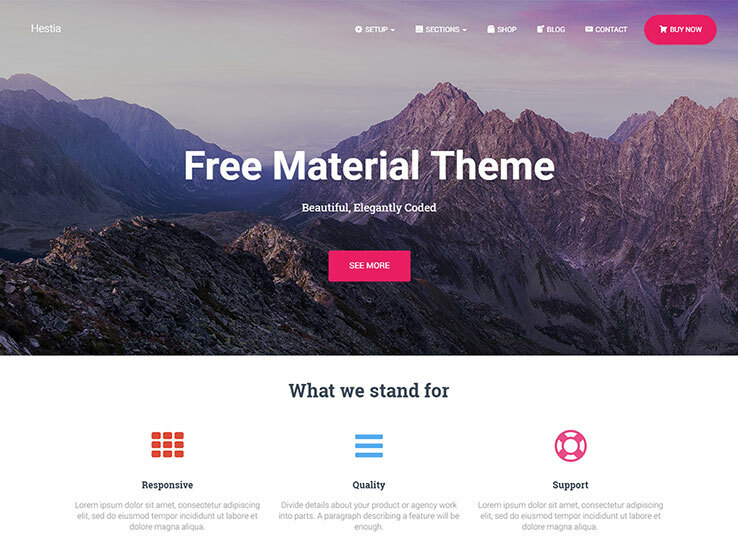 This is a really popular free theme featuring a cutting-edge design. 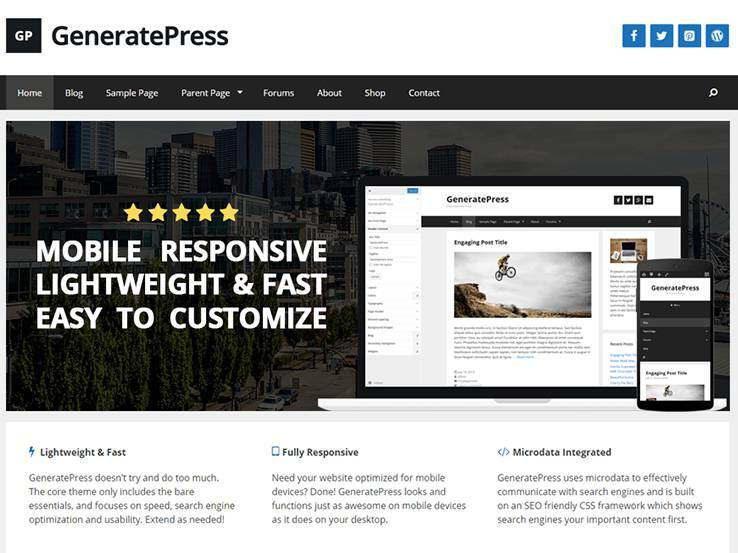 The Generate Press theme is a great free theme since it has tons of great reviews and ratings. The theme is fully responsive with easy to customize elements for your online business. It comes with a custom background and custom colors which are a great starting point to branding your website. Feel free to translate the theme into any language you want with the help of translation files. The theme is WooCommerce compatible which means you can sell both physical items and digital downloads online, and it comes with an extensive customizer to modify the design without having to touch any code. Along with several sidebars, featured images, and sticky posts, you can’t go wrong with this theme. Hestia Pro offers businesses a great way to promote their valuable content and products all at once. Built as a multipurpose WordPress theme with material design, this one page theme offers business owners plenty of features for getting their site found, their content read, and their products purchased. For example, Hestia Pro comes SEO friendly for a strong online presence in search results. More so, it is built with optimized source code so there is never a delay in loading your pages. This means more site engagement. Lastly, it comes compatible with WooCommerce so you can easily build a site and start selling products in minutes. This theme also offers great ways to be noticed amongst the stiffest competition. For example, all of your content is easily translated using any WordPress translation plugin meaning you can reach a wider audience. Plus, you can change colors, fonts, sections, and more using the intuitive Live Theme Customizer. Create a custom background with an image, video, or slider, develop an extensive mega menu for easier user navigation, and do it all using the SiteOrigin Page Builder for simple drag & drop page building. 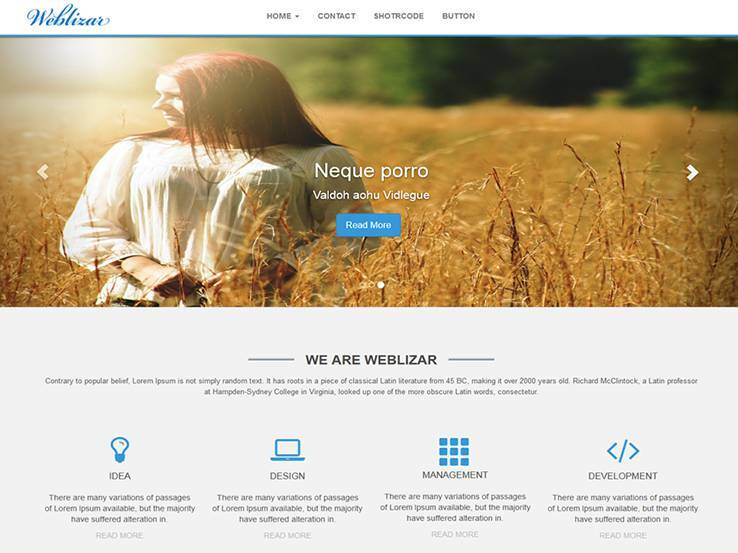 Weblizar is a lightweight and responsive free theme that just about any business could use to build an online presence. The custom background is great for adding a touch of your style and custom menu makes the navigation easy. The flexible header is a nice touch, and the logo upload only takes a few seconds. Threaded comments are included for interacting with your users and encouraging discussion. Choose from various different theme colors, and select from four different page layouts and two unique page templates. Social media links are also included which is great for growing your online presence. 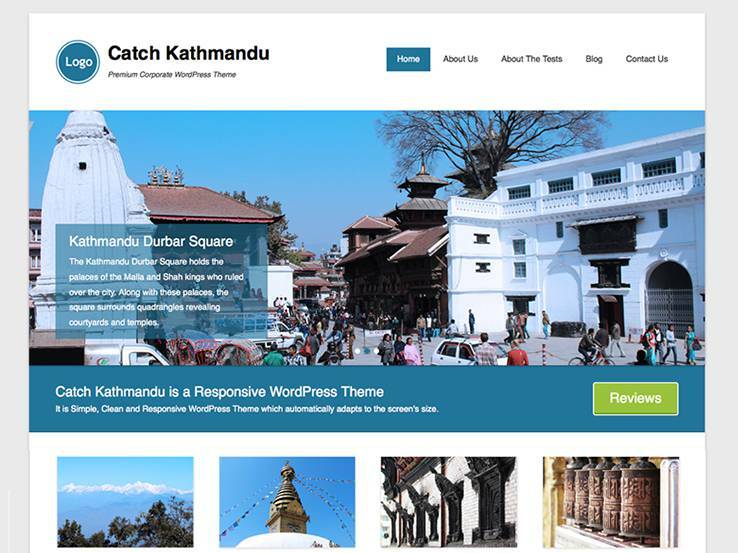 The Catch Kathmandu theme is another highly-rated theme, with support for a stunning header and a module that allows you to write your own reviews. The fully responsive layout lets people view your website on mobile phones and tablets, and the translation features help you translate your entire website. Modify the custom background and add a custom header to reflect your brand. The threaded comments keep the conversation going which is great for encouraging user interaction. The default layout is the full-width template which puts all the attention on your content and eliminating unnecessary distractions. 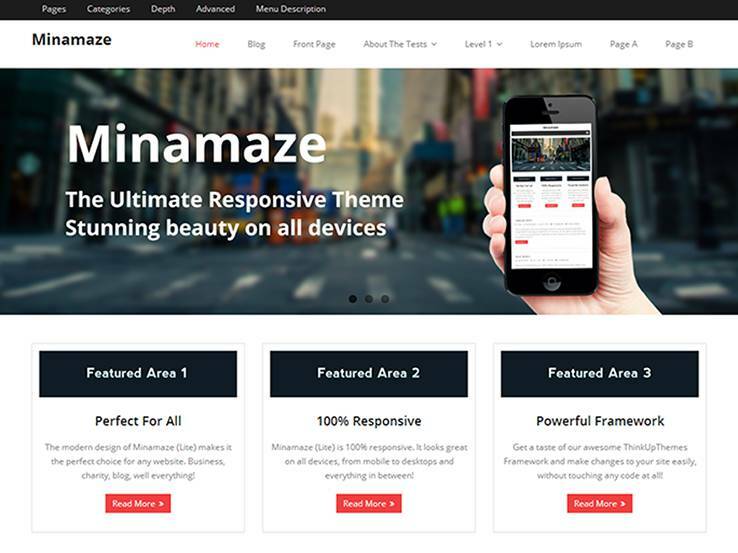 With the Minamaze theme you have the power to create a beautiful header area and use the custom widgets to add various content blocks without touching a single line of code. This is a free version of the multipurpose theme Minamaze Pro which means you will get a quality theme with basic features. You can consider upgrading if you enjoy the free theme and want to acquire some better functionality. Upload a logo on the site within seconds and customize your homepage with the help of the built-in homepage layout. The settings area and the theme customizer allows you to modify every aspect of the theme with ease. 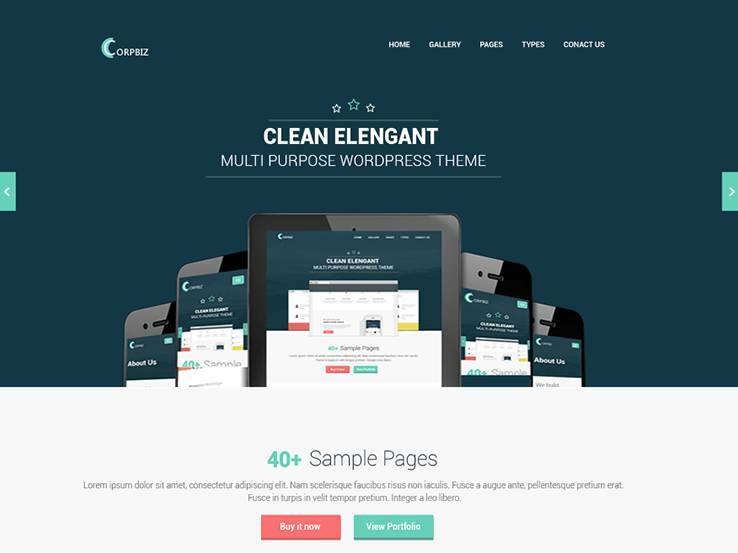 Customizr is a great name for this free business theme since it provides plenty of customization tools. Tons of great ratings only attest to the theme quality so you can rest assured this theme is a great choice. Upload your logo to build brand recognition and play around with the theme header to include a text overlay and buttons. Design in the live preview area to see how your changes are affecting your site in real time. Language support is included for building a multilingual website and threaded comments allow for a richer discussion of your latest posts. The responsive layout ensures your website will look great on mobile devices and the featured images support high-resolution photos for companies that like to post media. Change the colors to fit your branding, and consider using a full-width template for pages that need to be distraction-free. 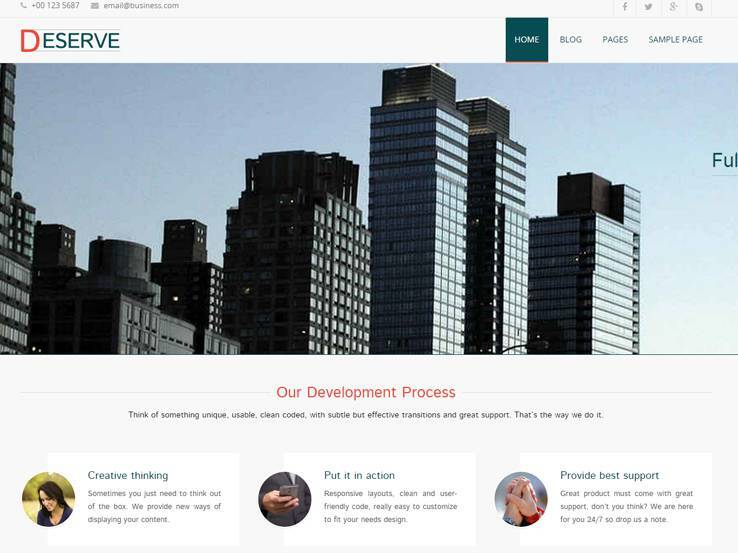 The Colorway WordPress theme is a viable option for any small business looking for a free theme. It features plenty of white space and a large header area for implementing text overlays and images featuring your products or promotions. Below that, you can showcase your blog posts or services in a grid-like format. The blog helps you boost your search engine rankings and allows you to attract your ideal audience. The Colorway option is compatible with plugins such as WooCommerce, meaning you can start an online shop and sell both digital and physical products. It also provides support for videos from sites like YouTube and Vimeo, along with a Contact Us page where you can place a contact from. The gallery features are rather nice, considering you can showcase some of your best past work and use it as a portfolio. Use the space directly below the header to show a custom welcome message to your visitors. Virtue is one of our favorites on this list because it’s a great free theme with plenty of options and stellar reviews. 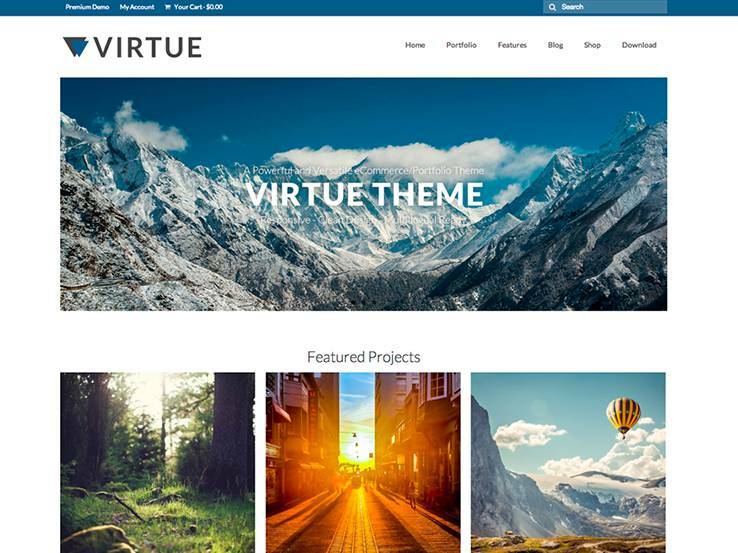 The Virtue theme has a clean layout with a large header and a grid-based layout for your featured projects. A search bar is included to help people navigate throughout your website and you can integrate with the WooCommerce plugin to sell merchandise. It’s completely responsive for perfect viewing on mobile devices such as tablets and phones and the powerful options panel has settings for changing colors, modifying your logo, and more. The sliders are customizable and allow you to create stunning slideshows of your products. Additionally, the custom fonts allow you to easily change the typography. The custom menu makes navigation easy and featured images are a great way to draw the attention of your website visitors. Choose between one or two column layouts and consider placing certain widgets in your sidebars or footer areas to display featured content or popular blog posts. The theme options are rather powerful and the translation tools enable you to reach out to people from all over the world. 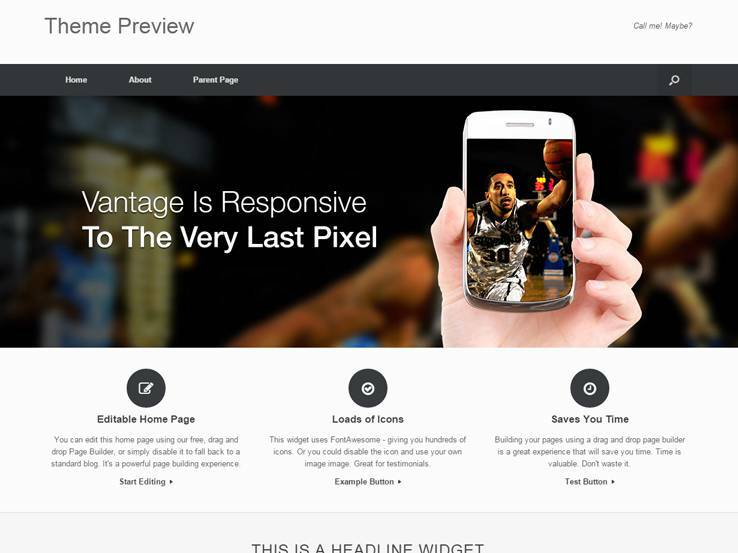 The Vantage WordPress theme is a highly-rated theme for businesses that are looking for a cleaner and more professional look. 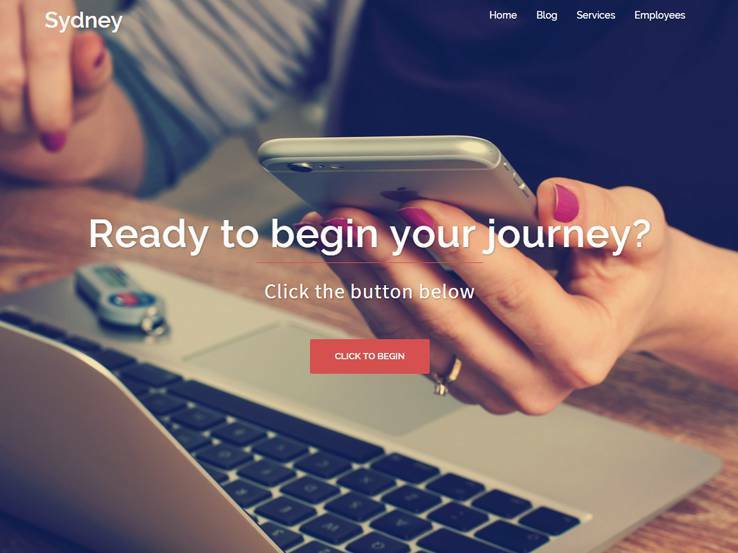 The theme features plenty of white space, allowing you to put your content front and center. The header area supports high-resolution images that can be used to showcase your products or special promotions. The responsive design is an essential feature today considering many people browse the internet on their smartphones and tablets. The WooCommerce plugin integrates well with the Vantage WordPress theme. Setting up an online store takes a couple of minutes and you can sell both physical and digital products. 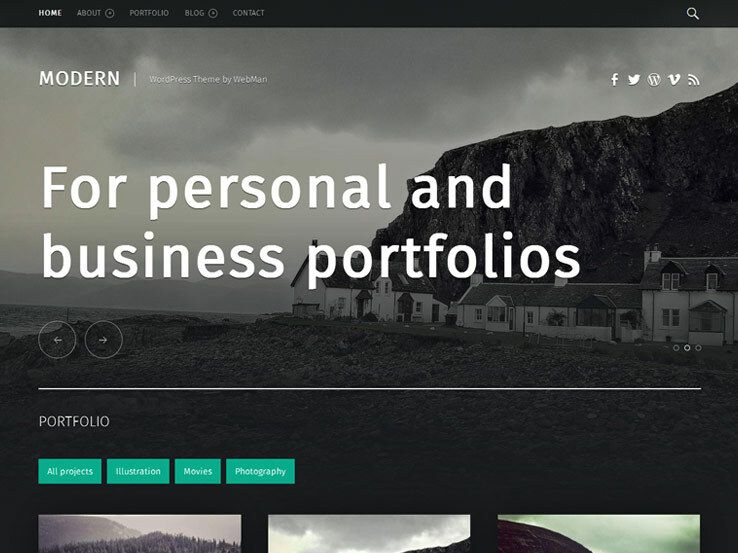 This theme can also be used as a portfolio platform, allowing you to add images to showcase your past work. The custom background is a great starting point when it comes to design customization and custom menus allow you to include all the important pages on your website. Threaded comments are great for encouraging conversation on certain topics discussed in your latest posts. The Vantage WordPress theme is completely ready for translation so you can easily connect with a global audience. Overall, the Vantage theme is a clean, modern, and professional option, so don’t hesitate to give it a try. The Spacious WordPress theme is another one of our favorites, with a large number of downloads and stellar ratings. It has a spacious and incredibly clean layout which is also responsive. The header area allows you to add text overlays and buttons for call to actions, while the search bar at the top of the page ensures visitors can find relevant information. Four different page layouts and two page templates allow you to add variety to your website while the 13 widget areas allow you to drag and drop various widgets on your pages. The theme has a default color scheme which you can change through the customizer. You can choose between a boxed and a full-width layout, along with dark and light skins tones. Available translations are nice for expanding your reach. Custom backgrounds and colors are a great starting point for branding your website. Create different menus to facilitate navigation and customize the header to attract the attention of your visitors. The threaded comments are a useful addition to your blog section since they allow you to easily respond to every comment. Take advantage of column features and custom icons to display your services in style. The Influence WordPress theme is far more than just another free theme. 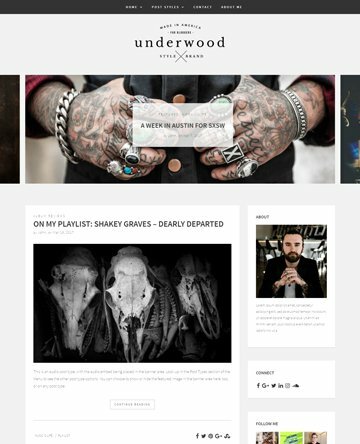 It’s built with a certain amount of flair and simplicity, combining modern design techniques with a clean blog layout. The header area combines a sleek menu that’s only visible when someone scrolls over it and you can also upload your own logo. This lets your visitors focus entirely on your content and eliminates the clutter. It also works exceptionally well on mobile devices. Use the slider to create beautiful slideshows of your products, promotions, seasonal offers or events. The custom background allows you to add your own photo that reflects your brand and the custom menu allows you to include all the relevant pages. Primary settings which include the default color scheme are well-organized on the backend and they are also easy to modify. The entire theme is responsive and the blog includes threaded comments so both you and your visitors can easily reply to multiple comments. 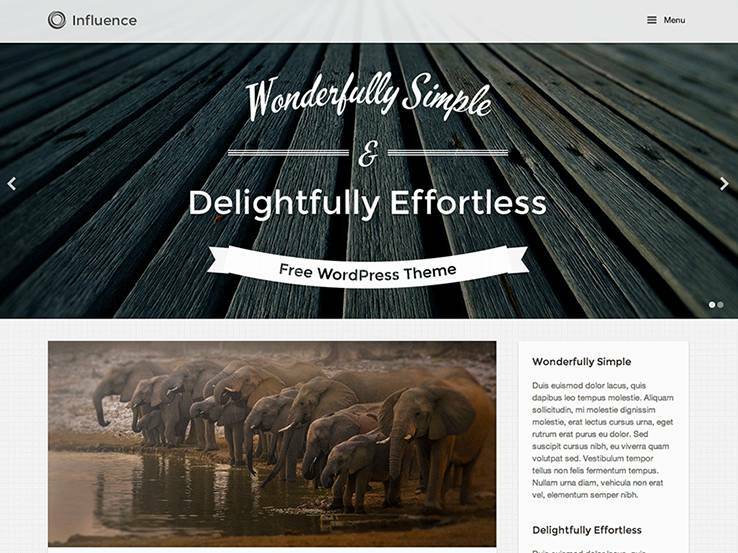 Overall, the Influence theme is rather impressive for small businesses so give it a try today. 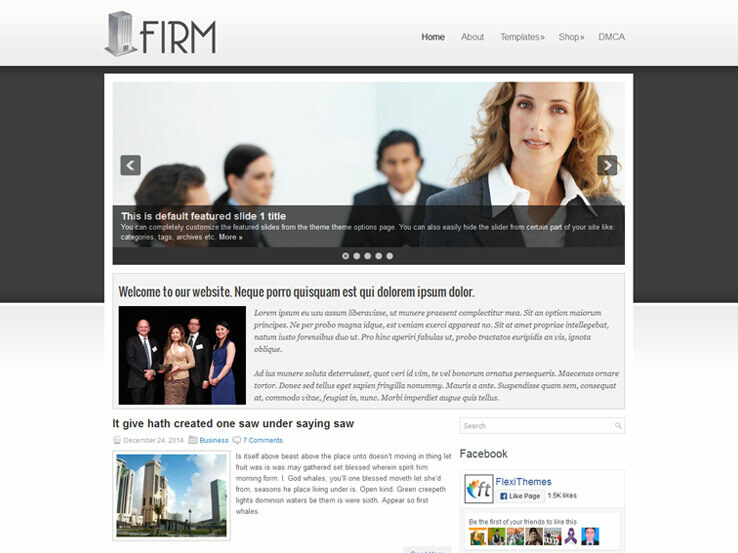 The Firm WordPress theme has a structure made just for small businesses and blogs. The responsive design looks wonderful for presenting your products and services on smaller devices, while the page templates provide everything from contact form pages to full-width pages without sidebars. The cool part about the contact form is that all you have to do is punch in your email to start getting communications from customers. The featured post slideshow serves as a way to share your most recent blog posts. We also like the localization in case your business caters to different locations or if the people in your neighborhood speak other languages besides English. SEO optimization is packaged in for boosting your rankings, while the WooCommerce compatibility ensures that selling products online is a smooth and convenient process. Finally, some of the built-in widgets include sidebar site content and social media buttons. The Modern WordPress theme has a more creative portfolio design for small freelance businesses and design agencies. For example, a photographer would have a great time presenting her work with filters and featured images throughout the homepage. This responsive and modern theme provides a beautiful blog for sharing interesting articles and tutorials for your customers. In addition, the translation-ready code ensures that everyone understands the content. A header slideshow moves from image to image for a beautiful presentation of promotions, events, or new product offerings. The theme offers custom colors and backgrounds, and you can adjust the menu to make it more suitable for your own small business. Feel free to include up to three columns, and utilize the threaded comments to generate more conversation after your blog posts. Along with a fullwidth header template, sticky posts, and a few nice colors, the Modern theme gives a professional presence for all businesses. Think about downloading the SmallBusiness WordPress theme if you’re looking for a more playful and colorful platform. The background is completely customizable for an attractive and relevant look. The slider connects to your most recent posts, delivering titles, featured images, and more content for users to preview before clicking through. If you’d like to showcase some widgets, we recommend utilizing the front page, right, and footer sidebars. There’s also a fullwidth page template for when you’d like to get rid of all the distractions and make more of a landing page. The RTL language support adjusts languages based on who is viewing, while the threaded comments get you involved with the discussions that your customers are having about the blog. The theme supports up to two columns, which we particularly enjoy for presenting your services in an organized, column-based format. 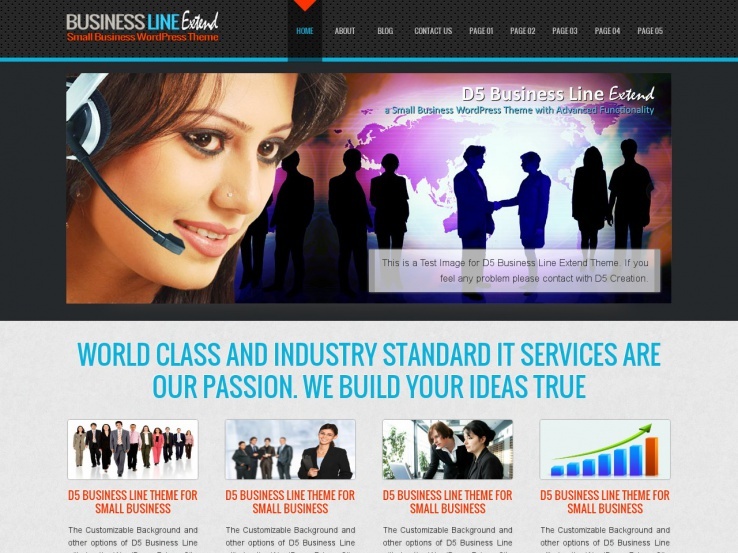 The Business Line theme provides an attractive look and feel, using a customizable background for companies to upload their own images or adjust the colors to match their logo. The slider uses images uploaded from the backend, and you can insert a header and descriptive text to explain what the image is all about. We recommend the theme for companies trying to present services in a professional way, since the modules below the header feature beautiful thumbnail images and titles for your services. The Business Line theme includes a footer and right sidebar for implementing certain widgets for social media buttons and recent post lists. You can also make a fullwidth page to present information about an individual product or to develop a beautiful tutorial on using your products. The theme is translation ready, and it allows for up to two columns. The comments below each post get people talking, while the portfolio works like a gallery for behind the scenes pictures or shots of your products. 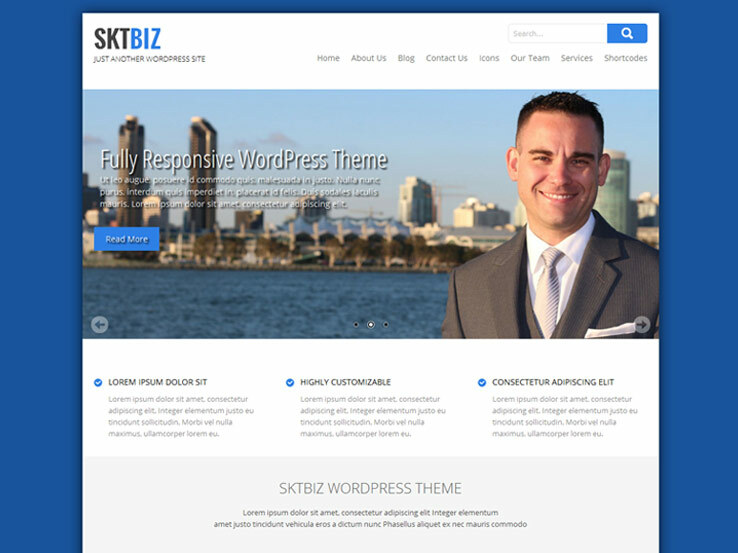 The SKT Biz WordPress has all the fixings to make a stunning small business WordPress theme. Not only does this thing look like a premium template, but it can work for any industry. The theme has a long-form homepage with modules for talking about your team members and sharing what your customers are saying about you. A full slider is there for displaying pictures of your services or business, while you also get shortcodes for tabs and buttons, strengthening the way you sell customers. Keep in mind that not all of the features are provided in the free version, but you can test it out and upgrade to the paid version if you really like the theme. The responsive theme provides various slides and transition effects, and the blog post and page templates provide bold fonts and strong readability. Social media integration is supported, and you receive a 404 error template just in case someone lands on the wrong page. Along with support for WooCommerce, Ninja Forms, and Contact Form 7, the SKT Biz theme stands out. 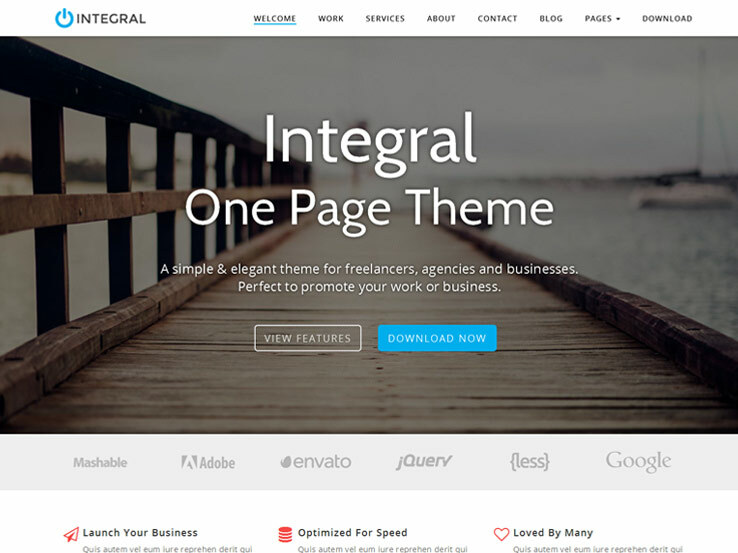 The Integral theme provides a basic, clean layout for businesses who want to stray away from lots of colors and distractions. The theme supports icons and columns for talking about your services in an organized fashion. Not to mention, all of your content is displayed on one page, bringing focus towards your best content and removing the need for people to jump all over your website. The rich color scheme has both light and dark shades, and you can adjust other colors to make them match up with your logo. The clean and minimal design includes a beautiful parallax effect. We like using the parallax in conjunction with buttons and call to actions, since you’re more likely to grab attention this way. 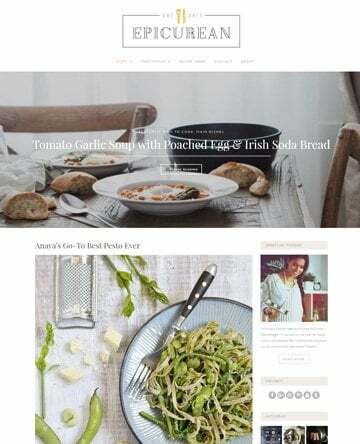 The theme is responsive for selling on mobile devices, and it connects nicely with WooCommerce. As for the businesses that should be using the theme, we like it for simple portfolios, but small businesses, agencies, and real estate companies should find it useful as well. The SKT Startup WordPress theme has a more unique structure than the majority of the themes on this list. It provides a large slider with the possibility for an email signup or contact form in the slider. 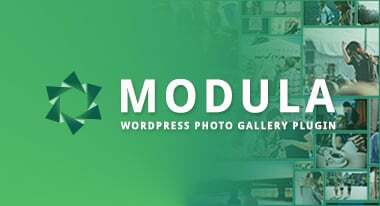 Services can be featured in the designated module below the slider, and you can show your most recent blog posts with featured images and strong fonts. You even get social media buttons for building the number of people who follow you on places like Facebook and Twitter. The theme has color changers for branding your site, and the built-in customizer allows you to adjust things like languages, menus, portfolios, and Google Fonts. What’s more is that the slider is compatible with various plugins that support video sliders. In addition, you’ll find that the WooCommerce plugin integrates beautifully with your site, making it much easier to sell products and collect payments from your customers. 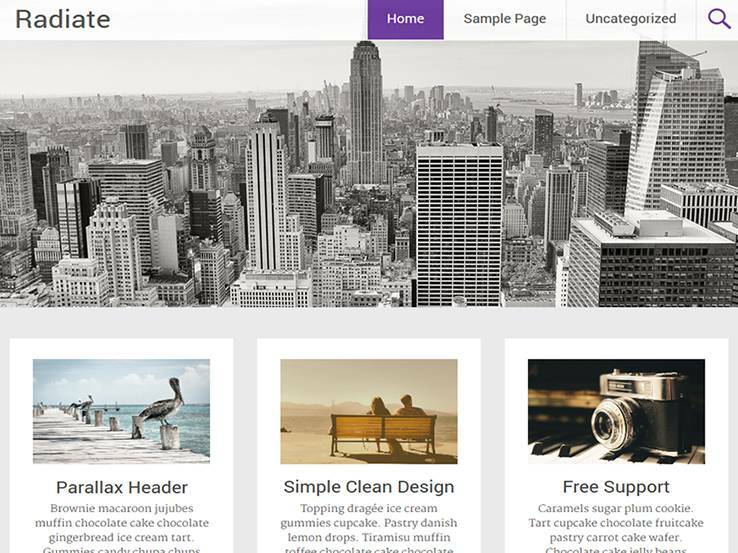 From Themegrill comes Radiate, a clean and elegant WordPress theme. It provides a great option for launching your business site. The gallery section is perfect for showcasing photos of your business or products, while the blog offers a great opportunity to share your knowledge and attract more people to your website. We also like that the template is highly customizable, which means you can easily configure it according to your specific needs. You can change the header image, colors, backgrounds, and fonts to match your brand. Besides, the Radiate theme is fully responsive and translation ready. 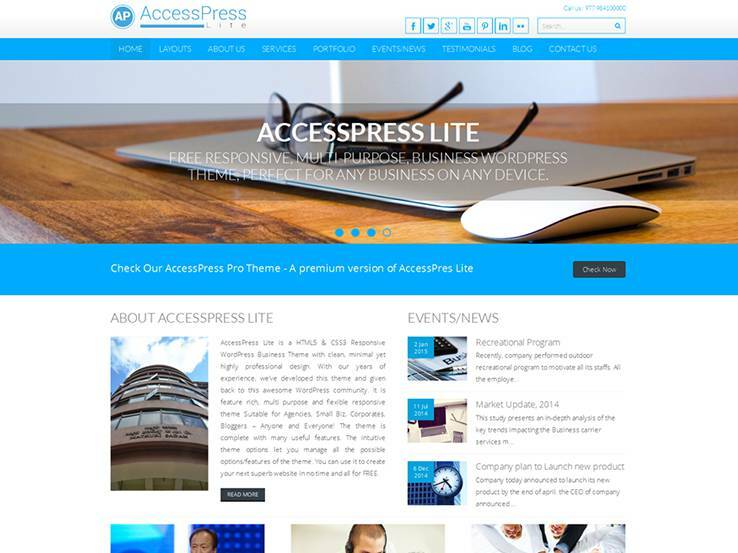 The AccessPress Lite theme is an amazing multipurpose WordPress theme with lots of powerful features you’d only expect in premium themes. It features a modern and elegant design, a beautiful front page slider, an events module, testimonials, portfolios, and team members. You’ll also find a nice spot to display your contact information and a blog to help you generate more traffic to your website. Social media integration provides a great opportunity to spread word about your business, while the translation tools make it easy to localize your website. Based on the popular Twitter Bootstrap framework, the Deserve theme comes with a sleek design and lightweight code that works great on mobile devices. The front page features an elegant full-width slider that will draw in visitors and then right below it you’ll find a spot to provide an overview of your services. The blog provides an opportunity to share your knowledge and grow your website, while social icons let you connect to other platforms. Besides, there’s a spot at the top to display your contact information, making it easy for people to get in touch with you. The Professional theme features an eye-catching front page slider, a showcase area that’s great for highlighting your past works or photos of your business, beautiful animations to add depth to your website, and a simple blog to help your site rank high in search engines. The template comes with multiple navigation menus, fullwidth page layouts, and a footer widget area that you can use to display extra information. Translation tools make it easy to reach an international market, while the responsive layout ensures people can access your website from all devices. Corpbiz is a multipurpose business theme that can be customized to suit just about any type of business website. It features a front page slider with overlaying text and buttons to drive people to your important sections, a nice portfolio module to showcase your previous works, and a services section to show what you do. The theme options panel provides user-friendly settings for styling your website, while the translation files make it easy to display your website in different languages. Besides, the template is mobile-friendly and Retina-Ready, which means your website will look beautiful on all devices and screen sizes. 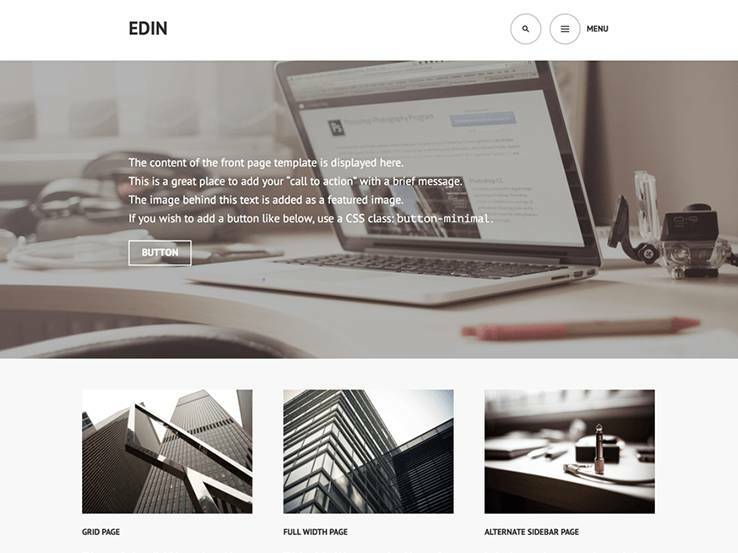 Edin is a beautiful, responsive WordPress theme with some useful features to launch your business website. You’ll find an attractive front page banner that has overlaying text and buttons to drive people further into your website. Social media integration allows you to connect your online profiles, while the Google maps make it easy for people to find your real location. Implement testimonials for the ultimate social proof. Furthermore, the Edin theme comes with several custom page templates so you can quickly get started with creating your site. You’ll also find custom menus, flexible headers, and an intuitive theme customizer for controlling your site’s settings. 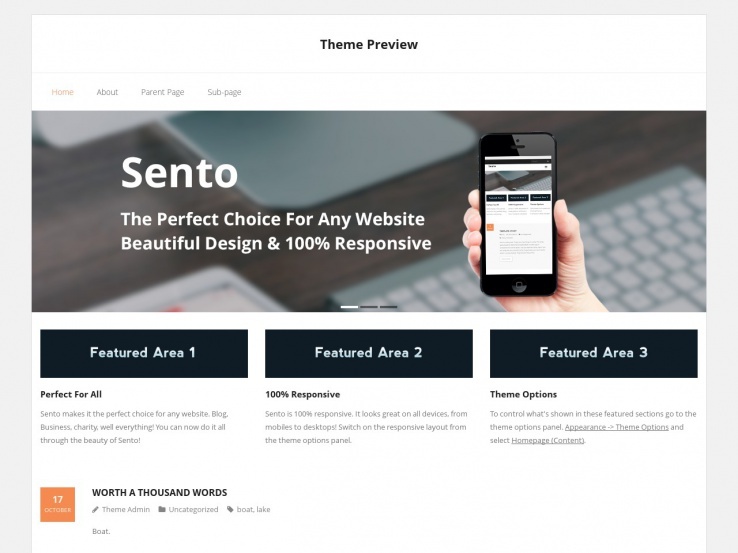 The Sento theme is responsive and Retina-Ready, which means your website will always look sharp even on high resolution devices. Integration with social media along with a clean and simple blog allows you to grow your business online. The front page features a nice slider that’s great for highlighting your best information, and a featured content section right below for displaying an overview of your services. The template works well with the WooCommerce plugin, which allows you to add an online shop to your website. Besides, the Sento theme is regularly updated and SEO-optimized to ensure your site ranks well in search engines. 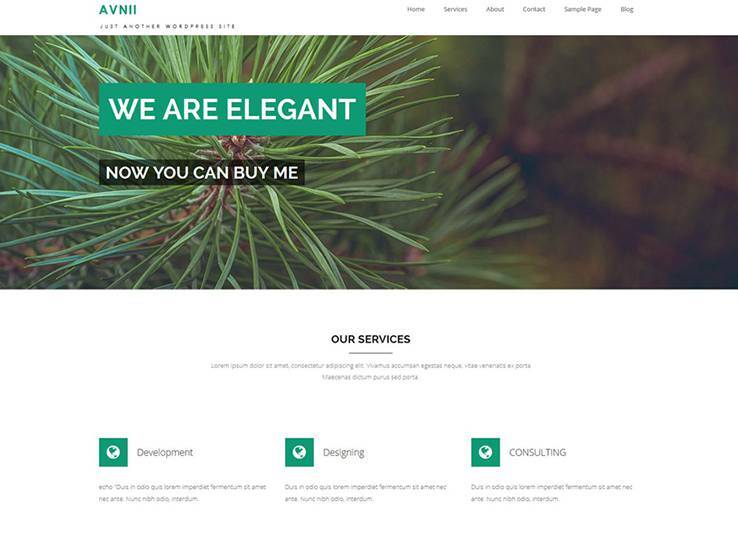 Avnii is a flexible and elegant theme with lots of negative space that puts the focus on your content. The professionally designed theme comes with a range of business-related features such as portfolios to showcase your work, a services section to present what you do, and a blog to share your knowledge and attract people to your website. The front page slider adds depth to the page content and you can also add overlaying text to draw-in people. The translation tools allow you to target an international market, while the intuitive admin panel makes it easy to customize the template according to your requirements. The Ultimate theme with a clean and professional design along with an impressive set of features and customization options. The homepage is well-organized with a beautiful slider at the top to welcome your visitors, a featured content area to highlight your services, call to action sections, a portfolio, and testimonials to enhance your reputation. You’ll also find a section to display your contact information and social icons to connect your social media profiles. In addition, the Ultimate theme is translation ready and highly customizable so you can easily style it according to your needs. 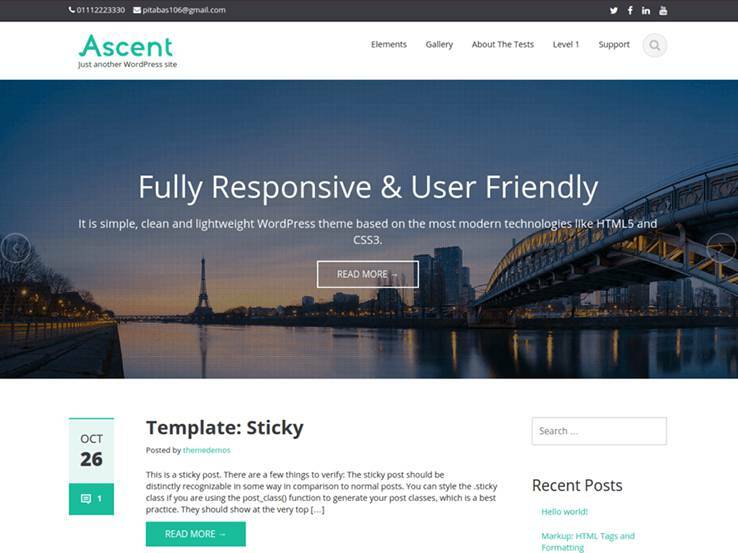 The Ascent theme looks awesome on mobile devices thanks to its responsive design. Use it to launch a sleek and beautiful website for your business. You’ll find an elegant blog to help you generate more traffic to your website, translation tools to easily localize your website, and an attractive homepage slider, complete with overlaying text and buttons to drive people to your important pages. In terms of customization options, the template supports custom backgrounds and menus, and you’ll also find an intuitive theme options panel for configuring your site’s settings. You’ll also find featured images and a gallery to showcase your photos as well as post formats to present your content in a variety of ways. 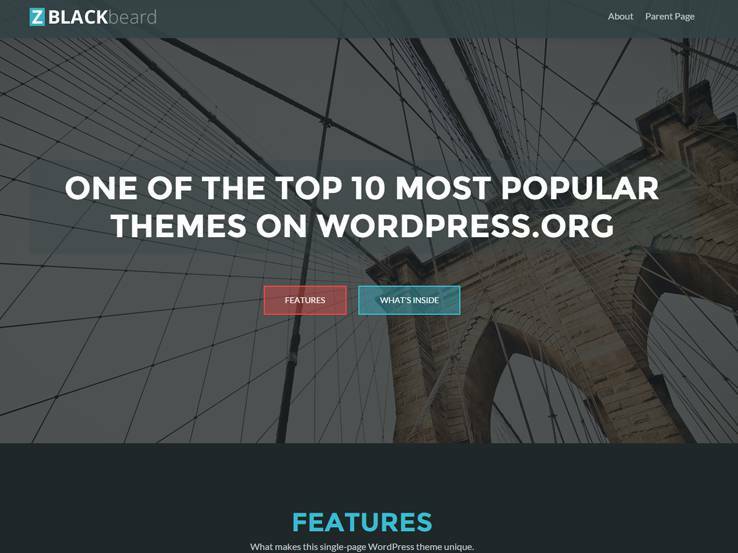 The Zblackbeard theme is a great option for agencies, entrepreneurs, corporates, and just about any kind of business. 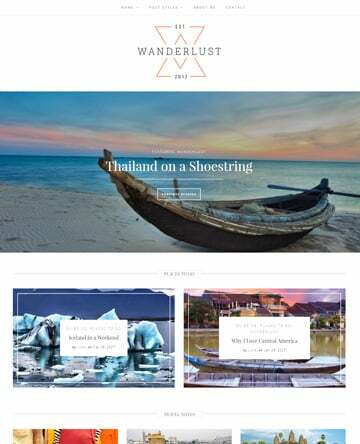 It comes with an elegant and professional design along with a set of useful features such as testimonials to enhance your credibility, a portfolio to showcase your work, an eye-catching front page banner with overlaying text and buttons, and nice blog section to generate more traffic to your website. You’ll find icons to add to your site’s visual appeal, custom backgrounds and menus, columns, and more elements to enhance the way your site looks and works. Also, the template is translation ready, which allows you to target people in different languages. 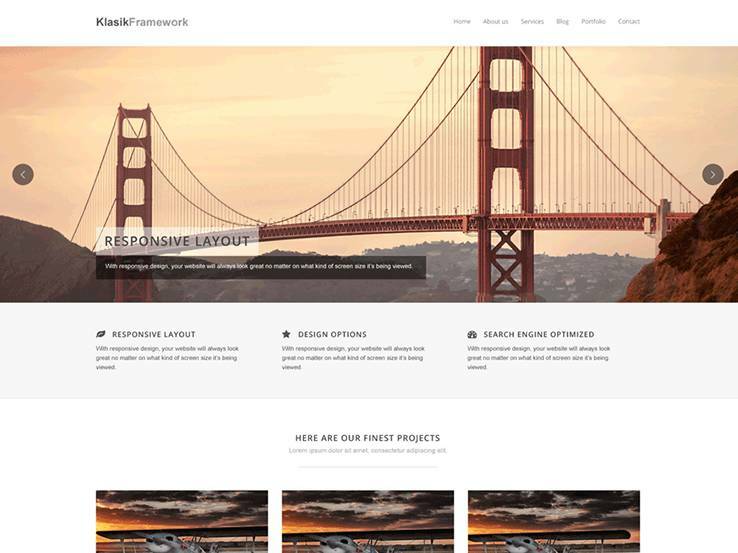 The Klasik theme provides a beautiful front page slider to highlight your important content, a featured content section just below the header, and a grid-style portfolio at the bottom section to display your previous projects. As a business person, you probably don’t have much time to spend creating your website. That’s why you’ll love the custom widgets, which allow you to drag and drop elements faster without coding. The translation tools allow you to display your website in different languages, while the responsive and Retina-Ready design ensures your website looks sharp and works correctly on mobile devices and high resolution displays. The Ophelia theme is a clean and simple template with some creative features to help your business website stand out from the crowd. It comes with an easy-to-use admin panel for controlling your sites look and feel, a slideshow to add to your front page’s attractiveness, and translation tools so you can easily localize your website. The responsive design looks great on all devices, while secure code helps keep the bad guys away and ensures optimal website performance. You’ll also find custom backgrounds and menus, columns, and page templates to get you started faster. 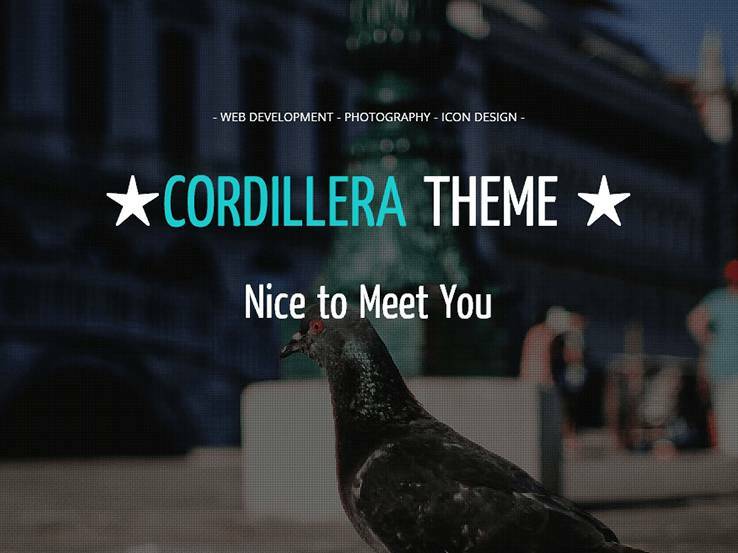 Cordillera is a flat and professionally designed theme with beautiful features for business sites. It comes with a fullscreen banner that supports both images and videos, call to action areas, and well-thought sections to display your services, portfolio items, and testimonials. Share your knowledge and attract more traffic with the blog that looks elegant with featured images. Additionally, there are lots of widgets to extend your site’s features, translation tools, and parallax backgrounds and background color options for styling purposes. 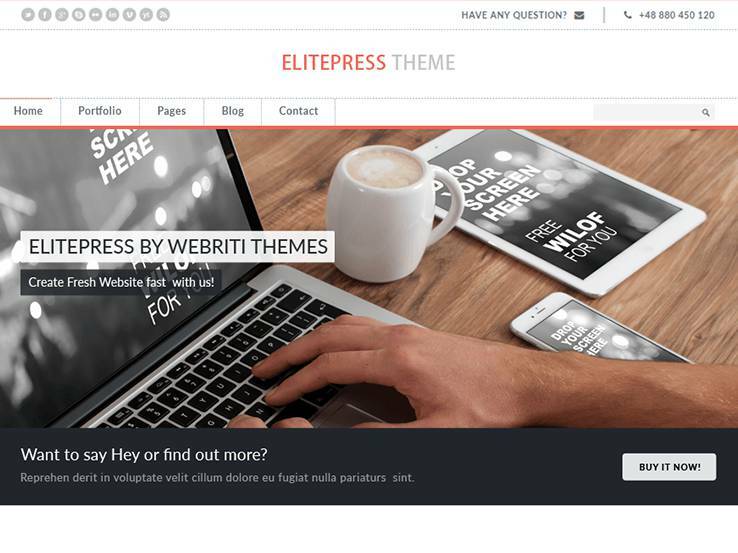 The ElitePress theme provides a simple, professional and stylish look and feel for corporate and business websites. The front page features a beautiful slider at the top and well-organized sections to present your services, latest projects, client testimonials, and blog posts. The homepage slider is perfect for highlighting important aspects of your business and includes overlaying text and buttons to drive people further into your website. You’ll find a spot at the top to display your social media icons and contact information so people can easily connect with you on other platforms or get in touch. The ElitePress theme is highly customizable, meaning you can easily fine-tune it to match your style. Besides, it’s fully responsive and translation ready. 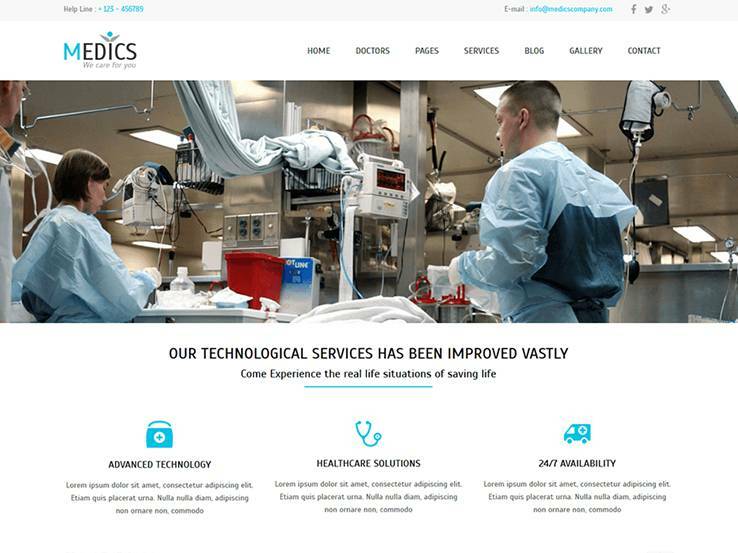 The Medics theme is built on the Twitter Bootstrap framework, which provides for a clean, modern and sleek design that looks perfect on all devices and screen sizes. Though it’s designed with the medical industry in mind, this template can easily be customized to suit a wide range of small business websites. It comes with an intuitive theme options panel for controlling settings, custom widgets for adding more functionality, a nice fullwidth homepage banner, call to action buttons, and more. Translation tools are also included, providing the possibility to display your website in different languages. Additionally, you can display your contact information and social media links at the top, making it easy for people to connect with you through different platforms. 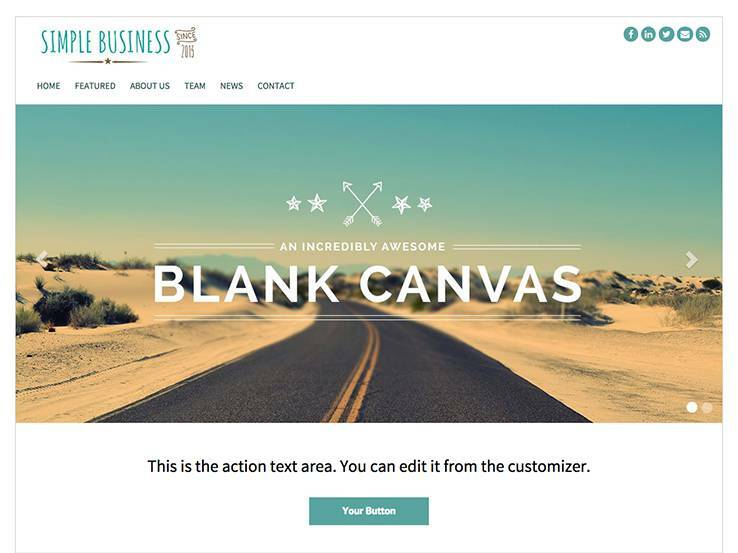 Consider the Impressive theme if you’re looking for a creative, clean and versatile template for your business site. It comes with an innovative header that features a fullscreen background image with overlaying text, social icons, a search form, and navigation menu items. You’ll also find a call to action section to encourage people to do business with you, and a nice blog that you can use to share your expertise and generate traffic to your website. In terms of styling options, you can customize many different elements including backgrounds, colors, menus, and the header. In addition, the translation files make it easy to localize your website, while social media integration will boost your online marketing efforts. 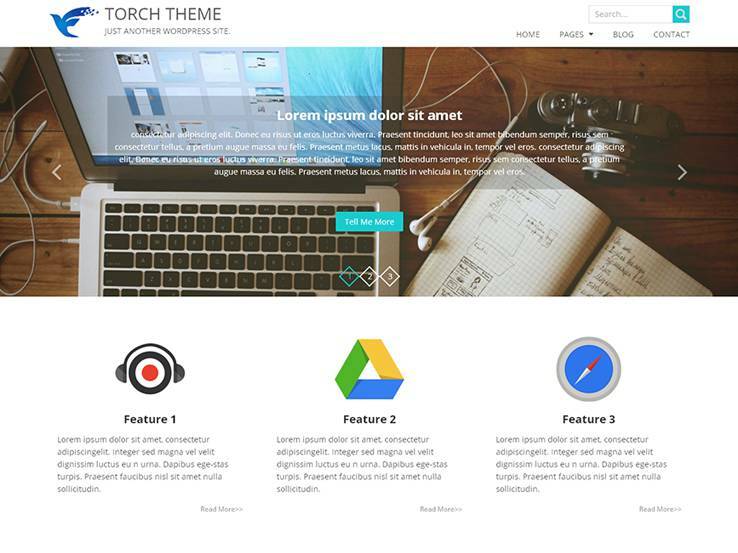 From MageeWP comes Torch, a professionally designed theme based on the Twitter Bootstrap framework. We like that the homepage is built using widgets, meaning you’ll require very little time from your busy schedule to setup your website. There’re 12 custom widgets for adding things like your slogan, services, testimonials, portfolio, client logos, and more. Use the elegant front page slider to capture visitor attention and send people to your important pages. Social media integration makes it easy for people to follow you and spread word about your business, while the blog provides a great opportunity to generate traffic from search engines and social media. Along with translation tools, responsiveness and theme options, the Torch theme is a great option for any type of business website. The Generator theme looks awesome on all screen sizes and is optimized for high resolution and Retina displays. The clean and versatile template can be easily customized to suit any type of business website. An eye-catching homepage slider welcomes your visitors, while the well-organized sections let you present your business professionally. You’ll find a range of styling options including custom widgets, backgrounds, colors, menus, and headers. 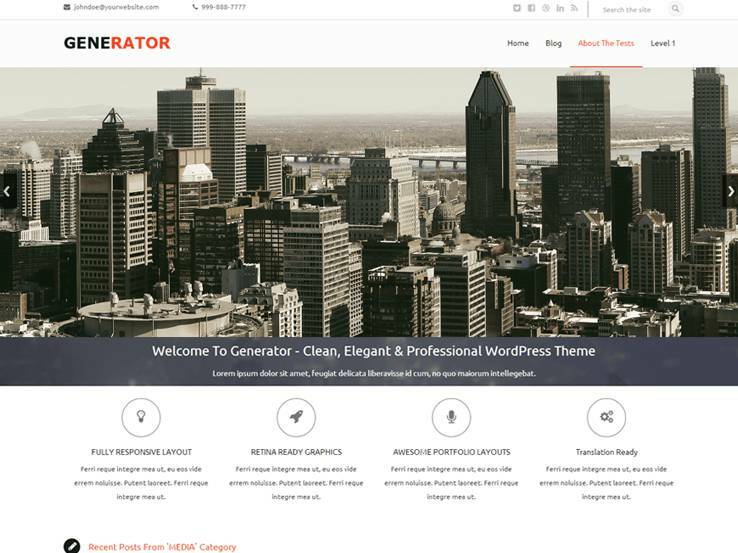 Moreover, the Generator theme comes with translation tools to easily reach a global audience and a blog to help grow your business online. You also have the option to display your social links and contact information at the top, so people can easily get in touch. 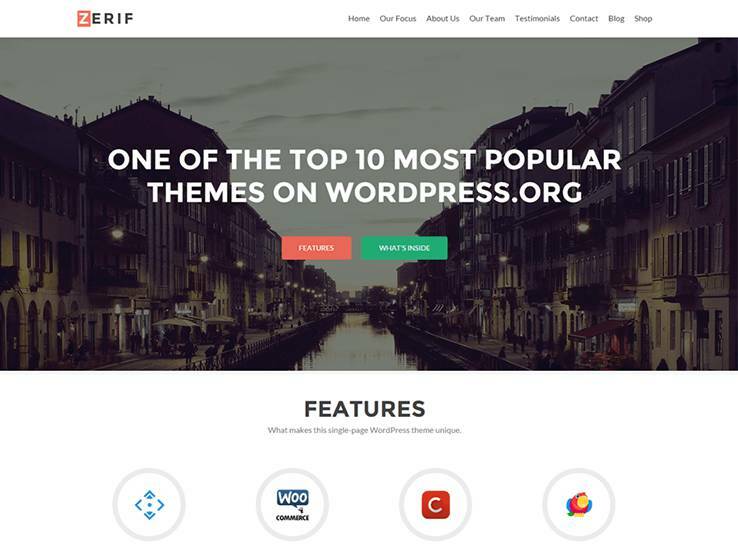 Zerif Lite comes from Themeisle, and is one of the most popular free WordPress business themes. 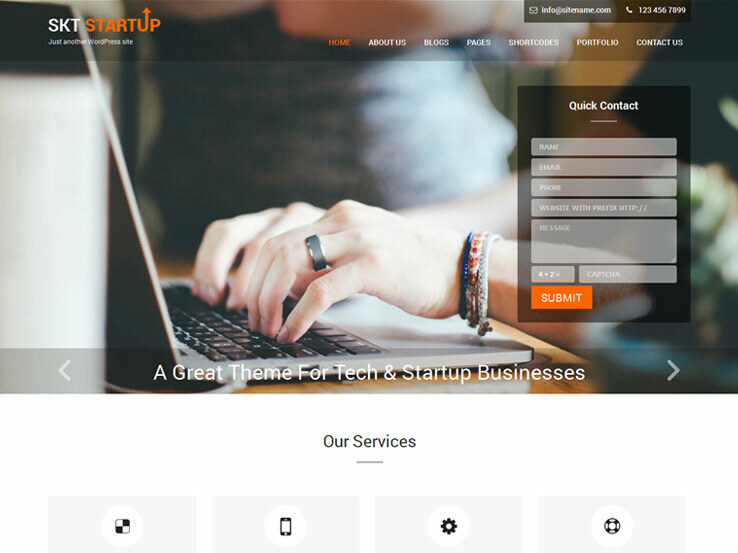 The one page theme comes with a professional design and has all the features you’d need to launch a successful website for your small business or start up. You’ll find a wide range of useful modules and sections such as team members, testimonials, and clients, as well as a nice contact form at the bottom for people to easily contact you. Integration with the WooCommerce plugin means you can add an online shop to your website within minutes, while the blog provides an opportunity to generate more traffic to your website. Besides, the Zerif Lite theme comes with a beautiful front page slider, social media integration, and 1-click updates and fast support. Alexandria’s front page features a business-style layout with an elegant fullscreen header background, a welcome section, a services block, and a testimonials section to enhance your credibility. The homepage banner includes overlaying text and call to action buttons to draw in visitors, while the footer allows you to display your social icons. The template is eCommerce ready, which makes it easy to sell your products and services online. Also, the theme comes with 2 pre-made color schemes, page layouts, and several widget areas so you can easily configure it according to your specific requirements. Besides, you can easily display your website in your native language thanks to the included translation files. Opulus has plenty of versatility. The front page offers a featured banner/slider area, large call-out text, blog feed with sidebar, or the full blog archive feed or homepage content area, with a widgetized footer. Opulus includes a full portfolio as well. 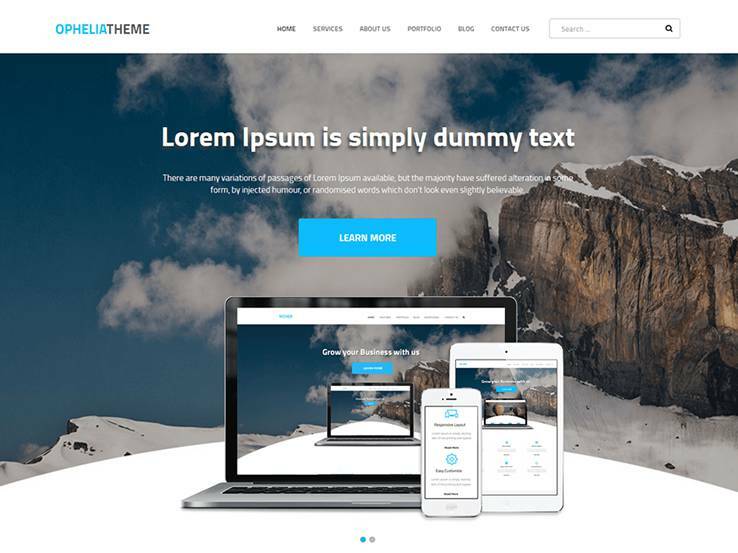 This theme is built with Bootstrap 3 to be beautifully responsive and includes up to 20 custom widgetized customizations. 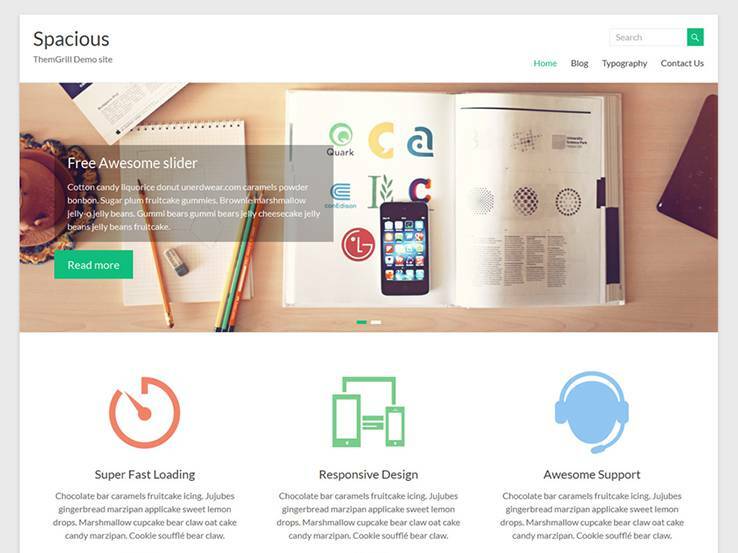 Opulus also features a Theme Options panel that allows you to modify any aspect of your website from fonts to colors. 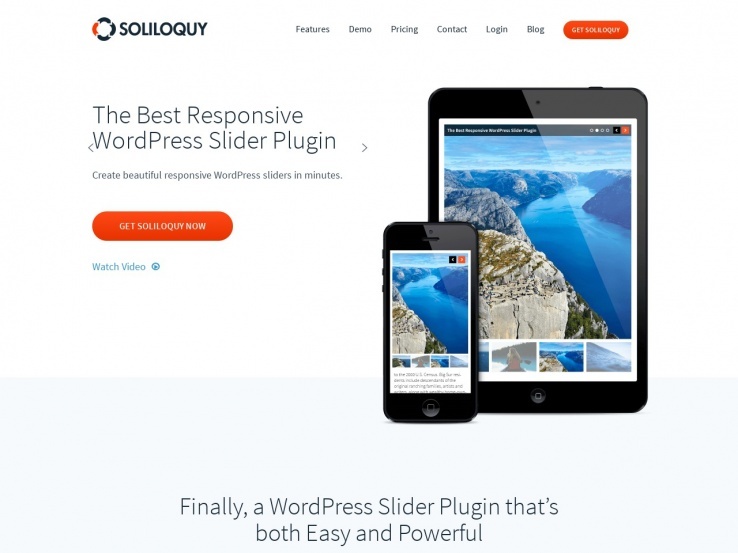 Soliloquy is another theme from Nimbus Themes that offers a Pro Version, so if you find that all of the great features offered in the Free Version still aren’t enough to round out your business site, you can upgrade from the Nimbus Themes Shop and also get access to personalized support from the Nimbus Team. 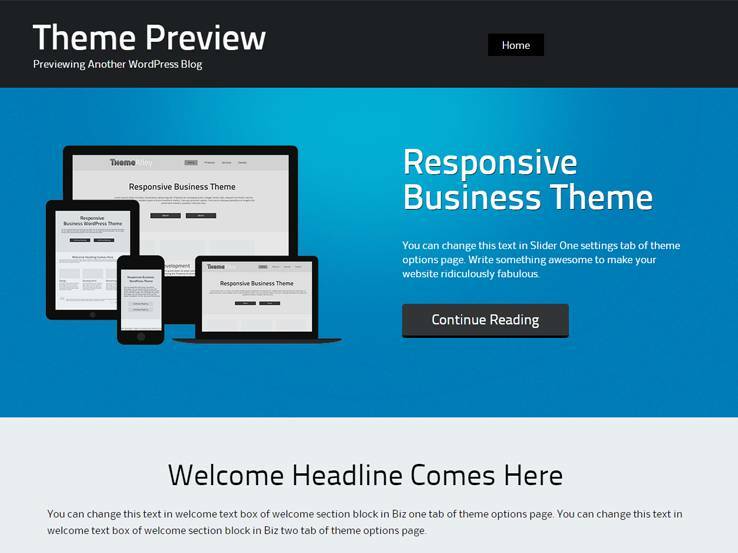 The free version of this theme is responsive and includes multiple page layout options. This theme has a high-focus on imagery which is perfect for creating a website that stands out from the competition. Alphabet is an impressive multi-functional theme that would be perfect for any business website. We will keep it in mind for a future update. Hi Bilqees,\n Check out our One Page Theme Roundup, for some ideas. You will then need to check with the developer of theme you choose to see if the two plugins will work with it. Awesome list. Thanks for sharing it 🙂 Syndney is a really cool theme! Glad you liked it, and you are right Sydney is a nice theme. 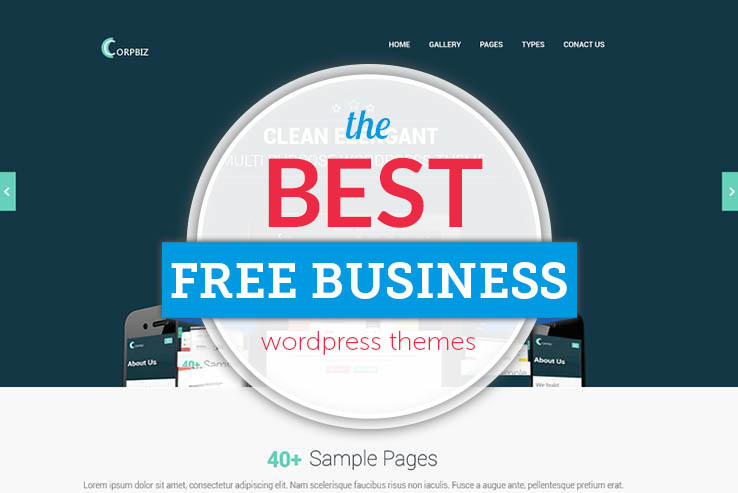 These lists of free business WordPress themes are really great. You certainly have put a great effort in compiling these lists. 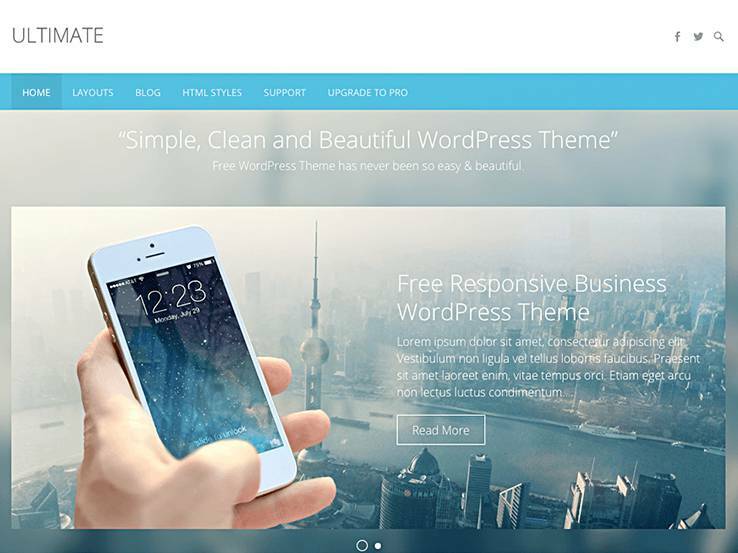 Codepress Lite is another free business WordPress theme. You may like this as well! keep up the great work. Glad you enjoyed this roundup of themes, and thanks for the suggestion. Codepress Lite looks like a very versatile theme for a small business. We will keep it in mind for a future update.